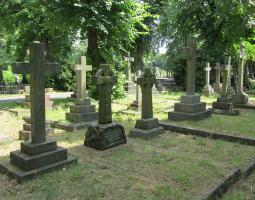 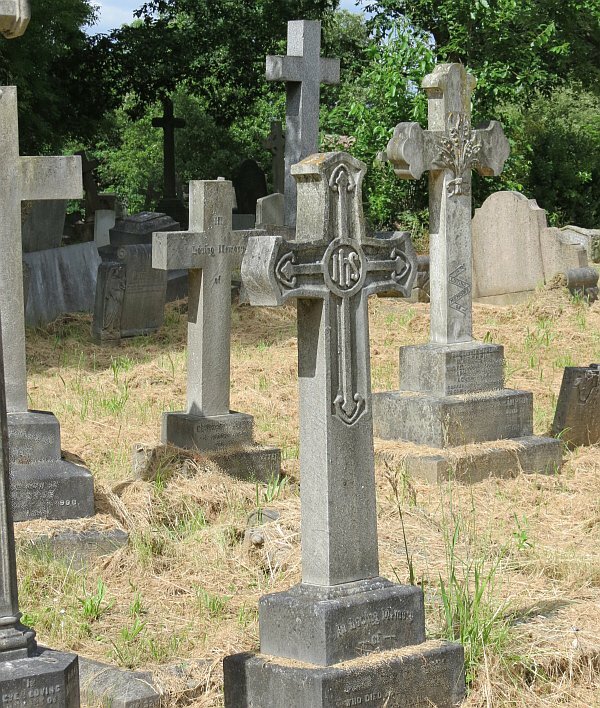 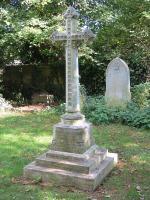 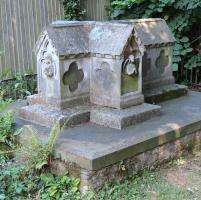 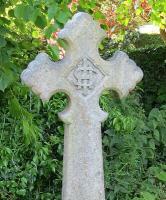 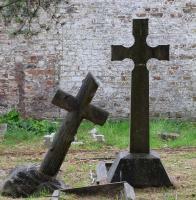 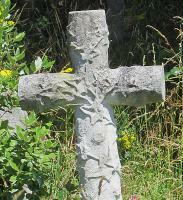 Monuments in the form of crosses or crucifixes are among the most popular of all designs for simple outdoor memorials. 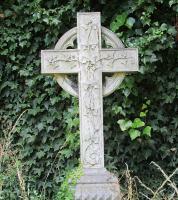 Strictly speaking a crucifix depicts the crucifixion, but the term crucifix is popularly used interchangeably with cross these days. 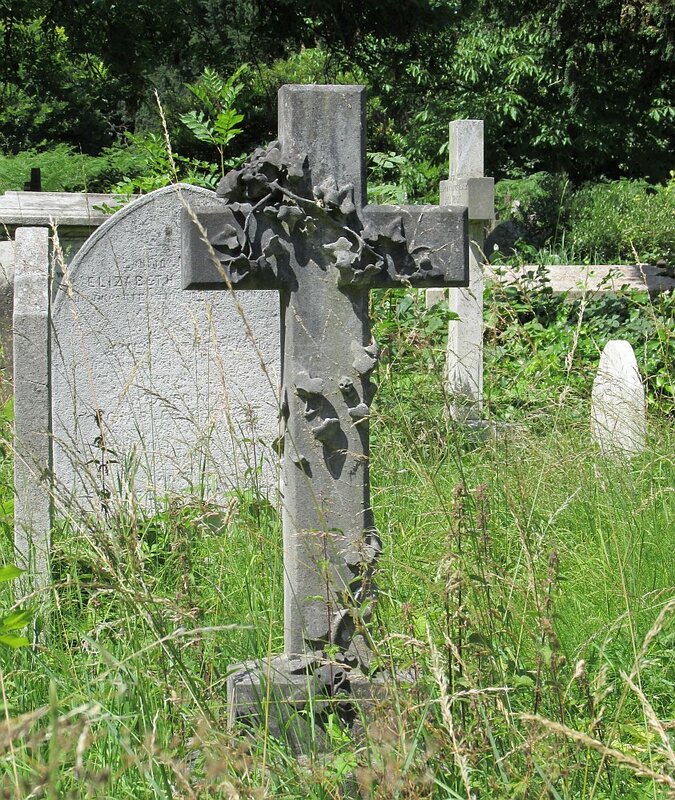 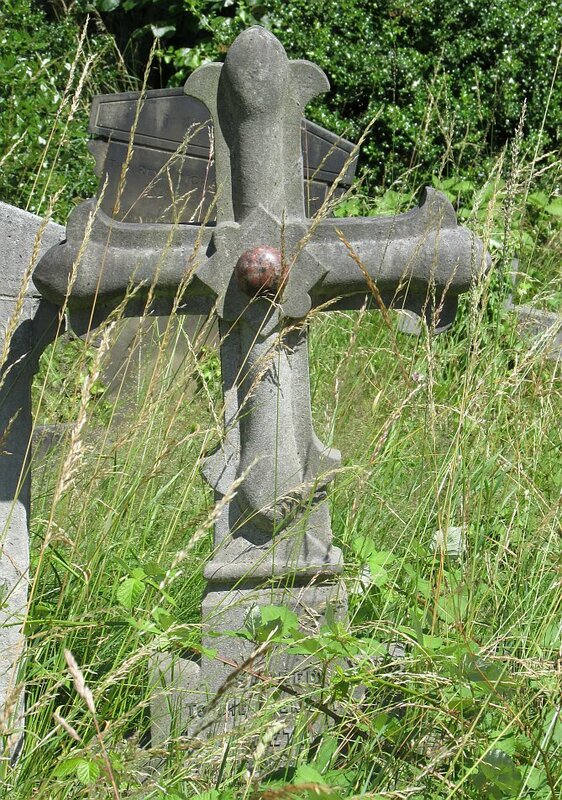 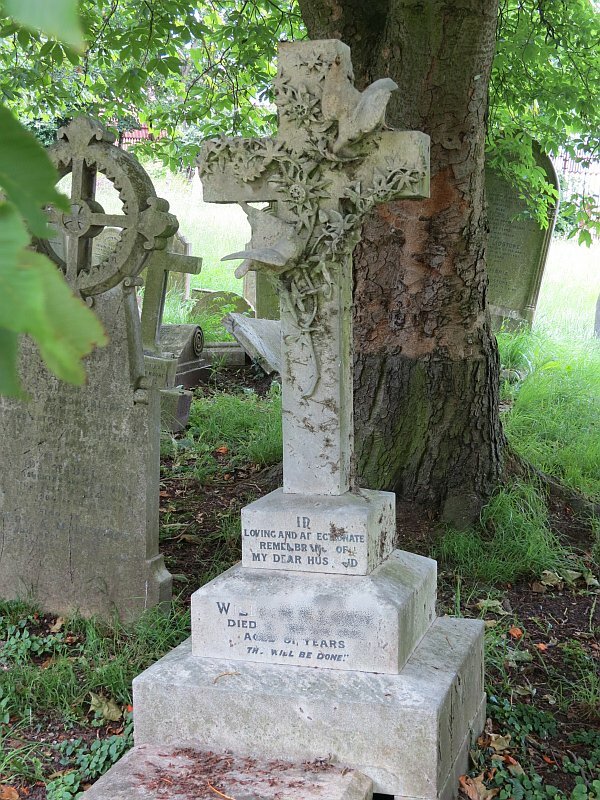 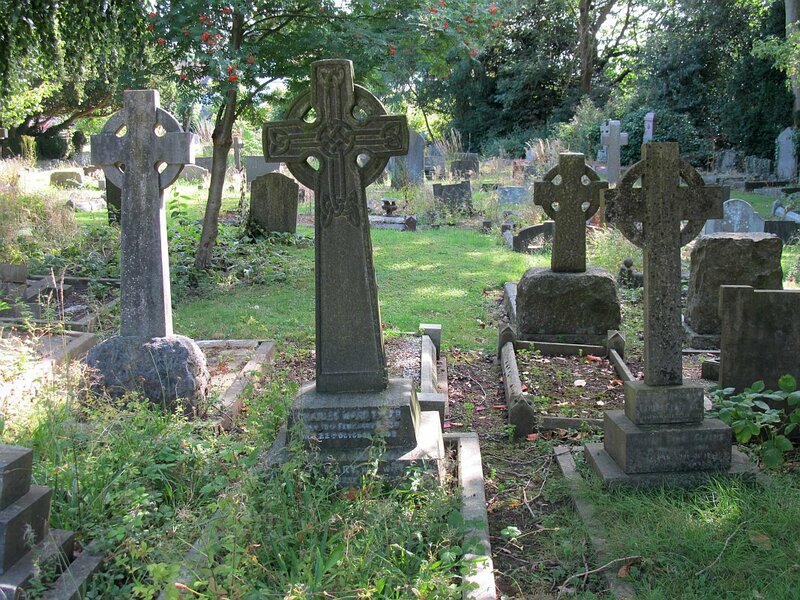 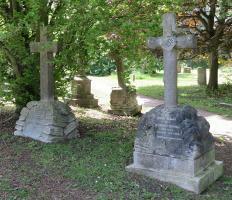 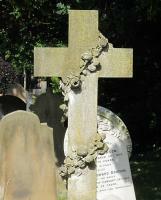 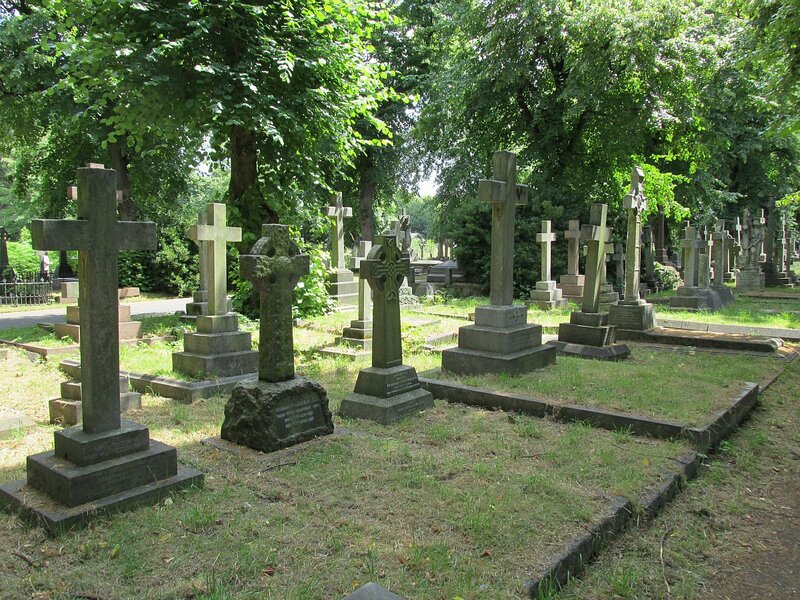 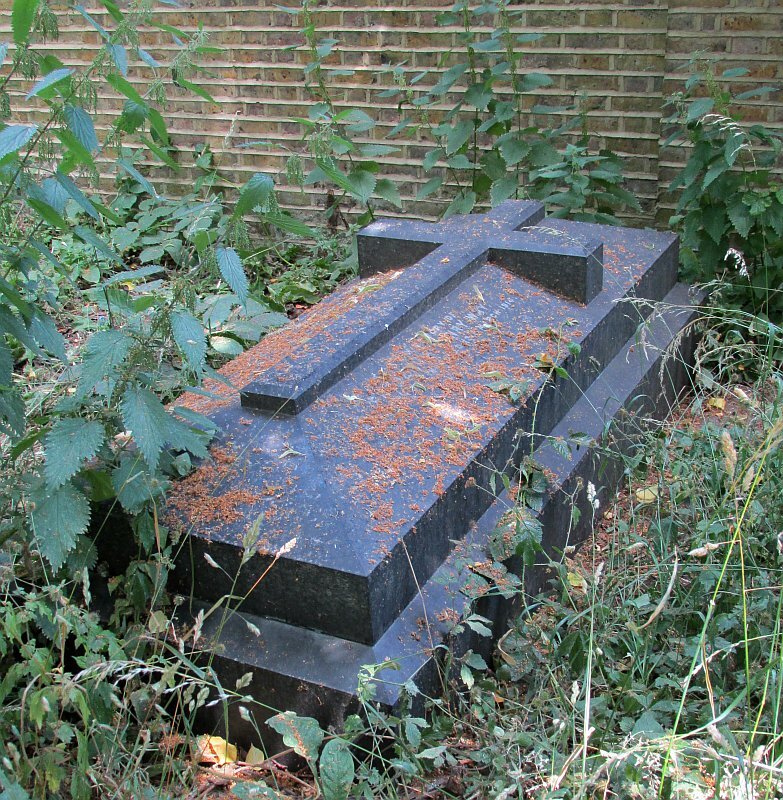 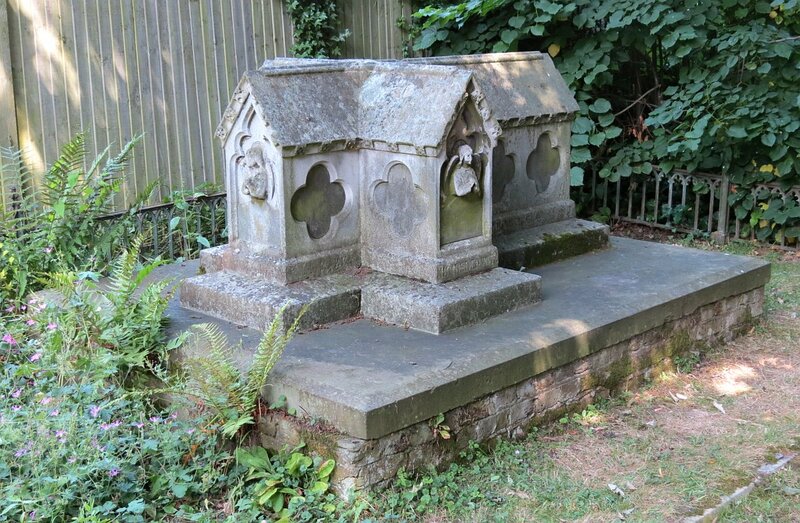 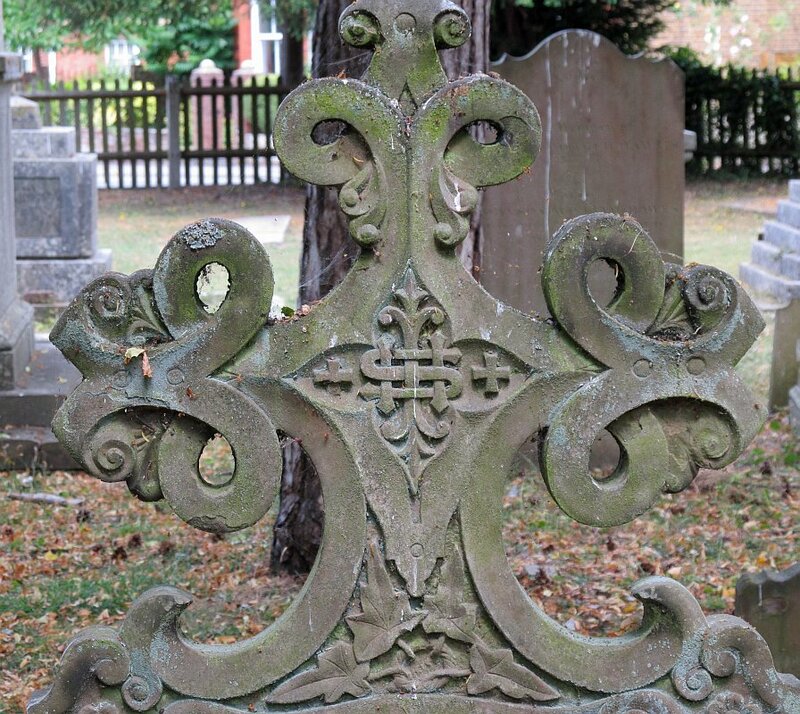 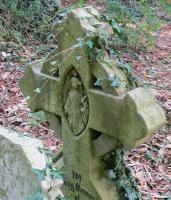 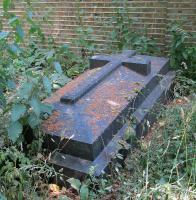 A casual glance in churchyards and cemetery often shows little clusters of crosses, or even ranked masses of them. 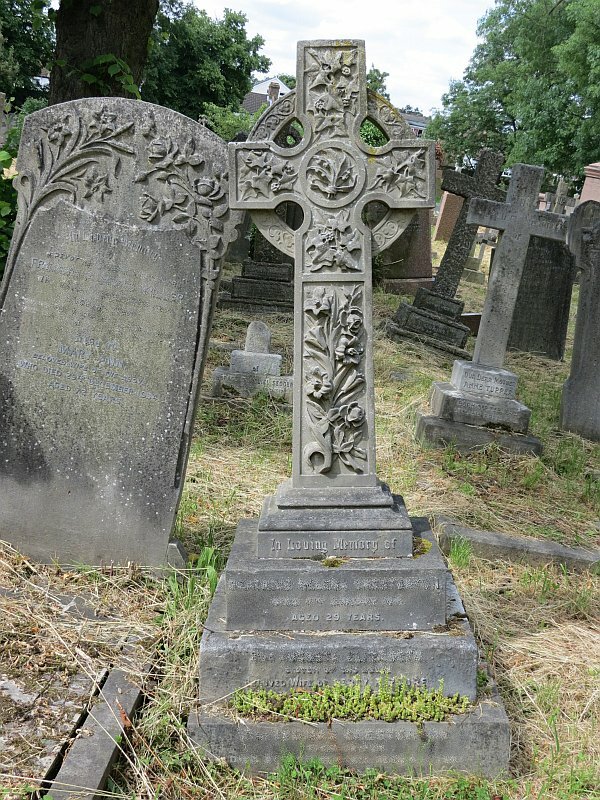 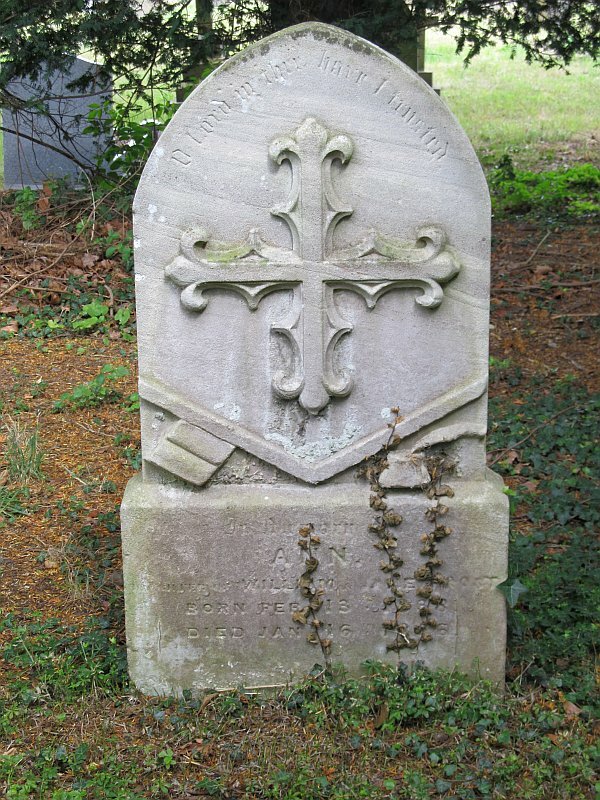 The simplest ones are completely plain, but for those of interested in carving and sculpture, the cross or crucifix provides many opportunities for embellishment: indeed, the sheer number of monuments with crosses means that every manner of inventiveness has been applied to give distinction and variety. 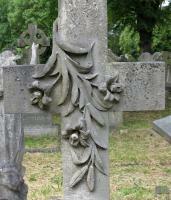 A carving of a plant or flower on the cross is a good place to start, being a popular motif. 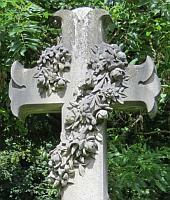 Ivy is the symbol of clinging memory, and is widely found. 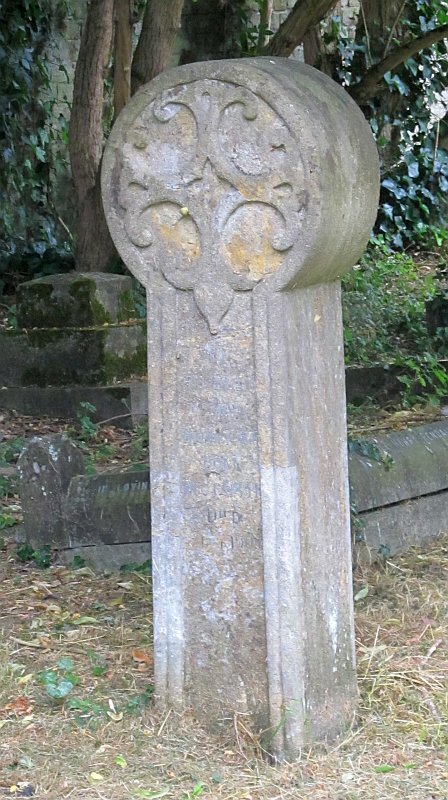 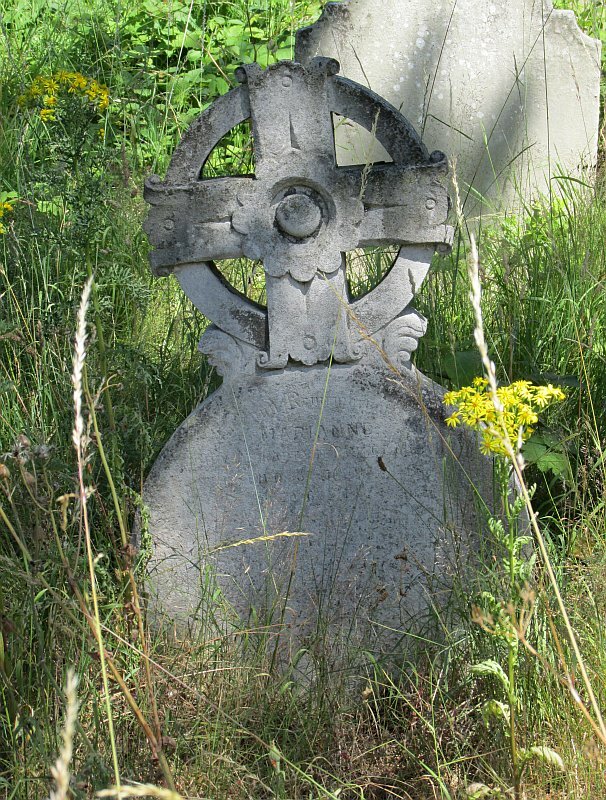 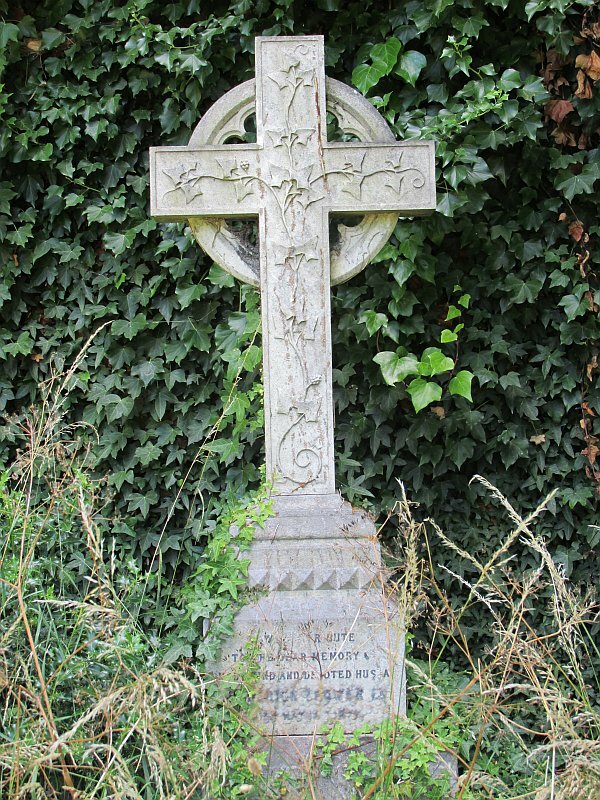 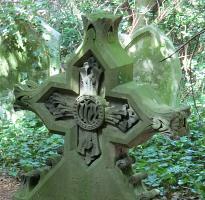 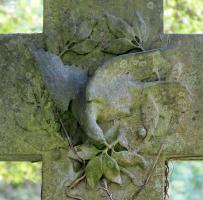 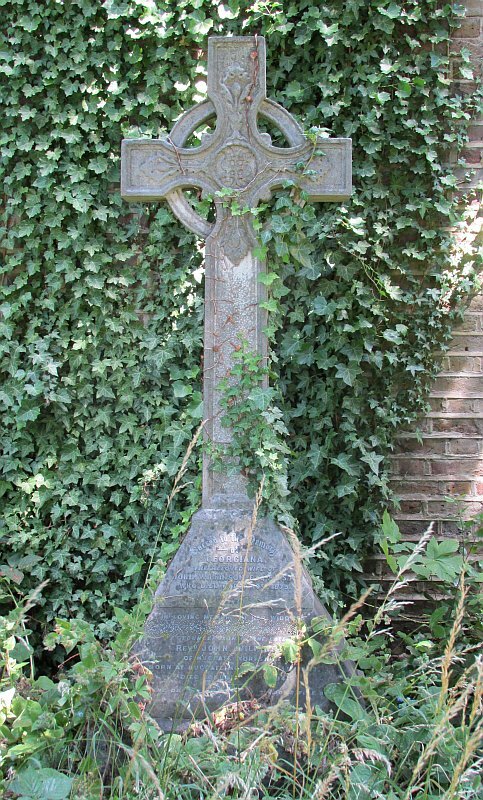 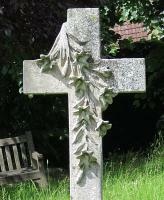 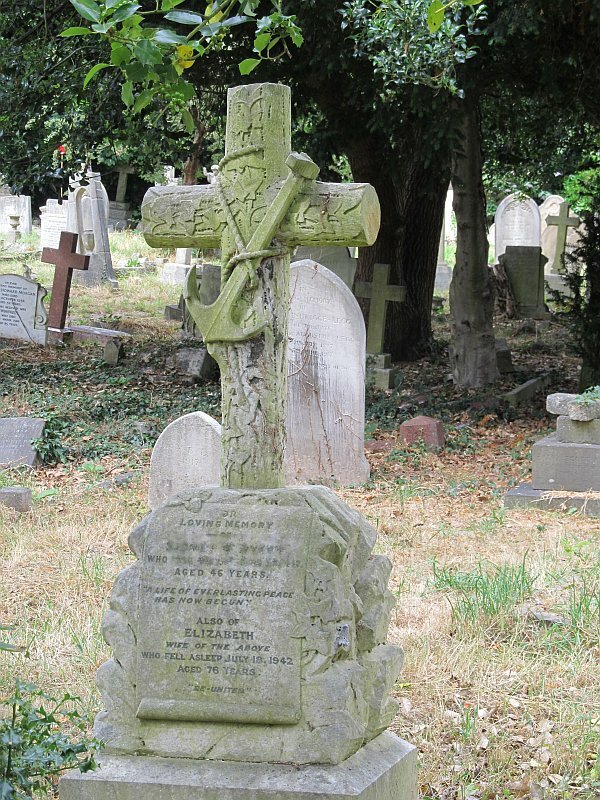 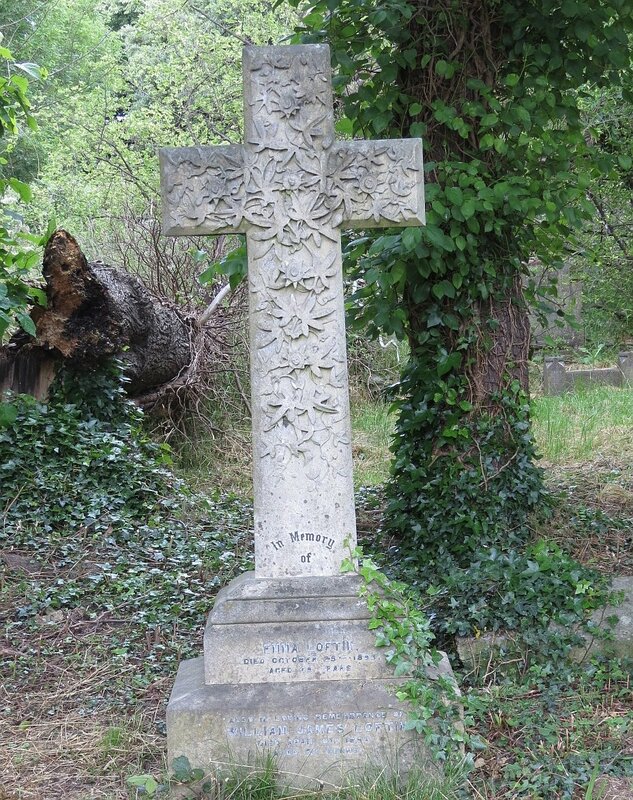 The example below left is typical, with the ivy carved to wind round the cross. 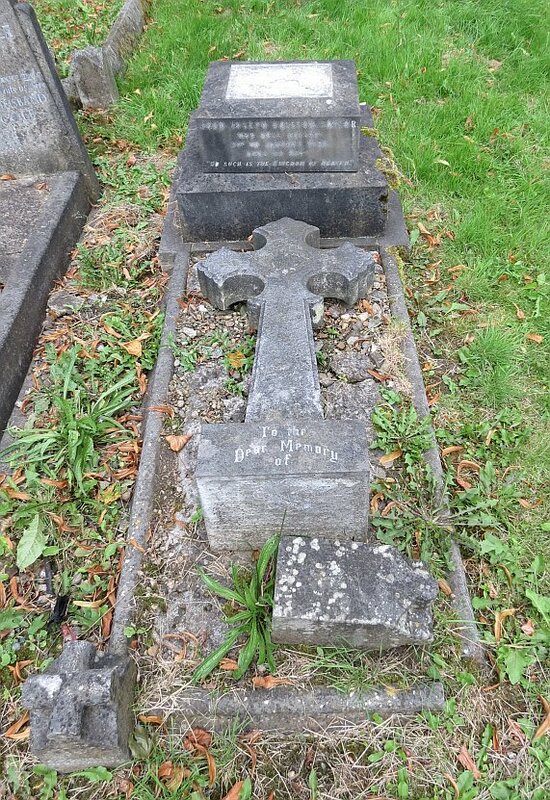 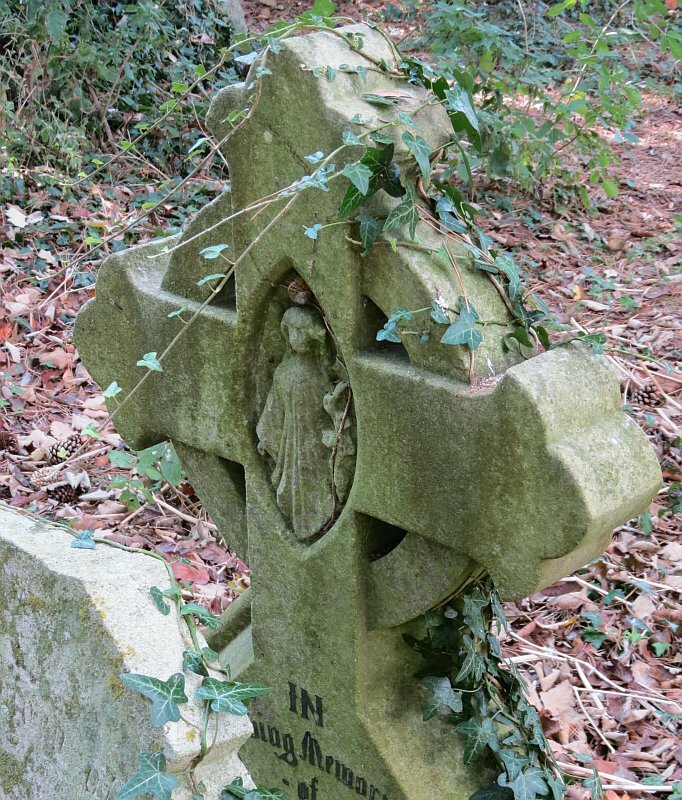 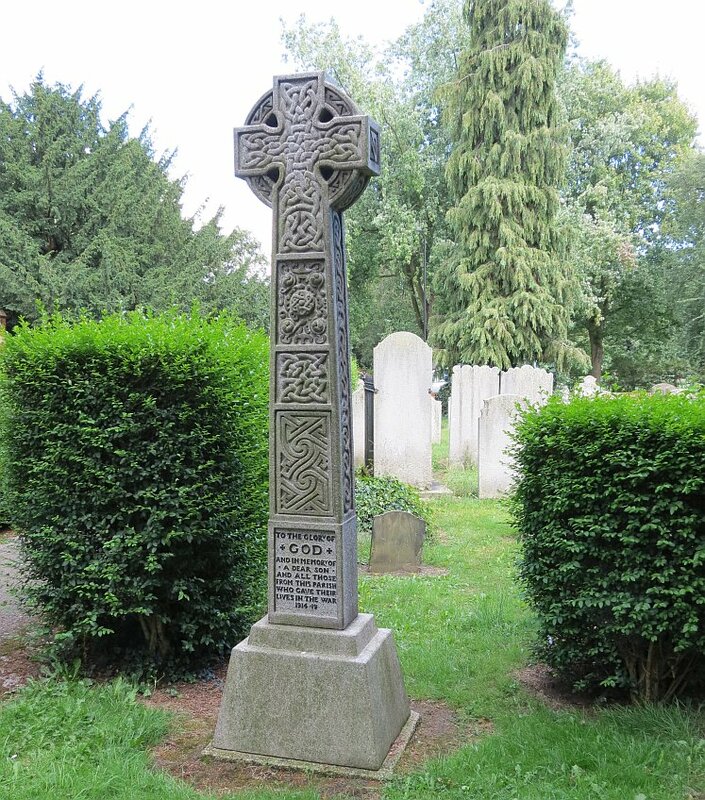 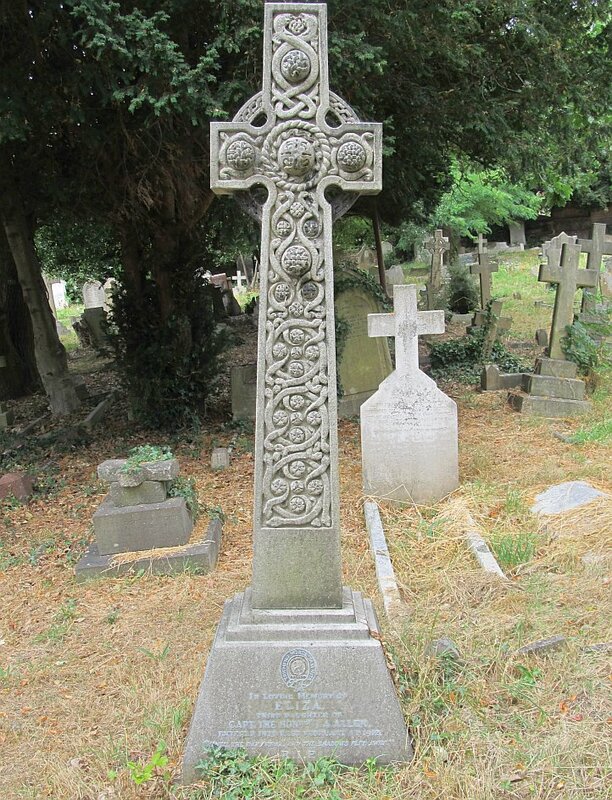 Below right is a much larger cross, again with the ivy spiralling round the central shaft of the cross and spreading out on the side pieces - you will need to click to enlarge to appreciate most of the examples below. 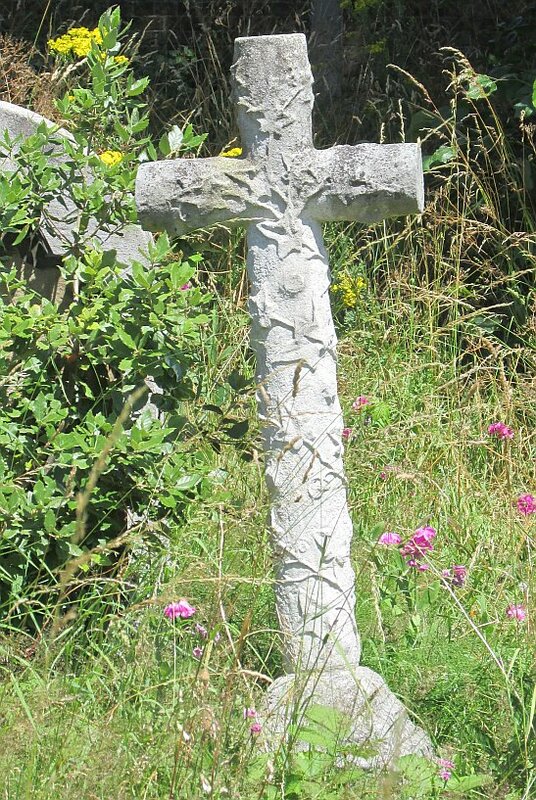 Ivy carved on monuments with crosses . 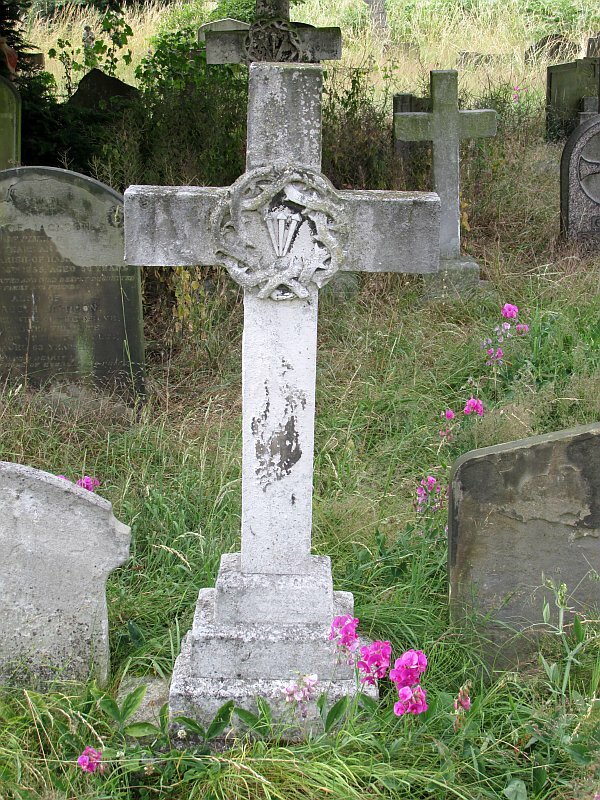 Roses are another favourite, with their connotations of beauty and romantic love and fidelity. 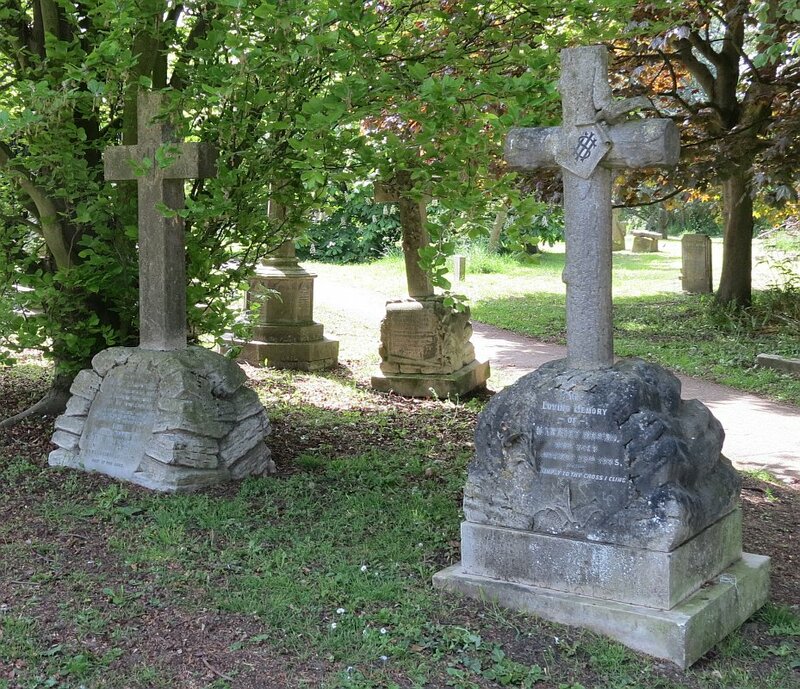 Here are three examples. 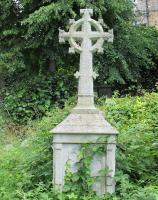 Below left, roses carved winding round the shaft of the cross, rather like we saw with the ivy. 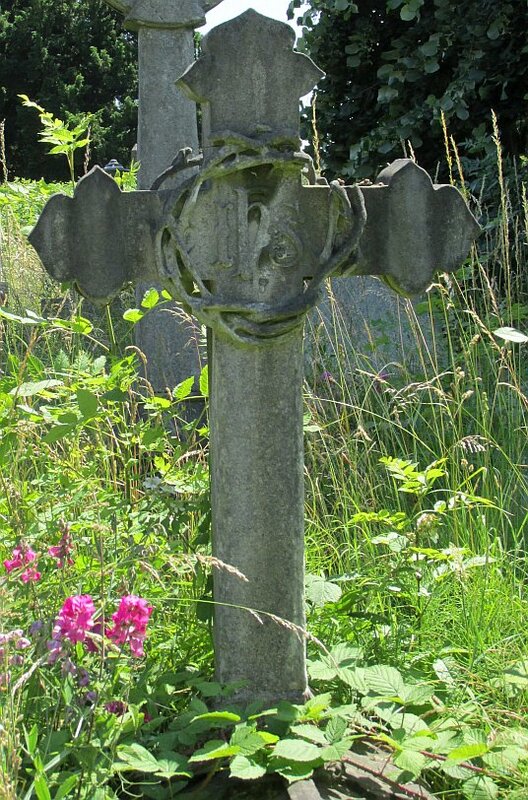 Centre, a very fine and well-preserved loop of roses about the cross, as if a wreath; a couple of lilies are also included, of which more below. 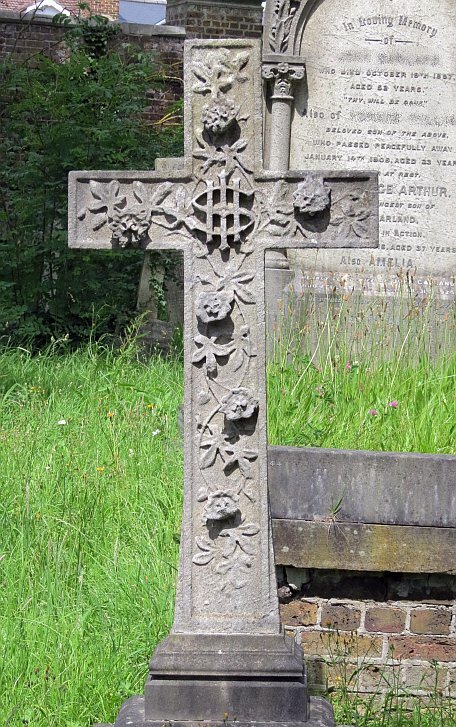 And a different design below right, with the branch of roses in a fairly symmetrical and stylised arrangement on the body of the cross, carved in high relief rather than in the round. 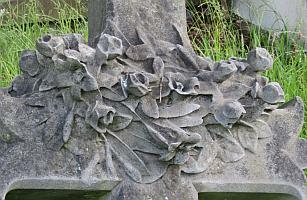 Alas, carvings of roses are fairly delicate, and many become fairly shapeless lumps after some years of exposure to the elements. 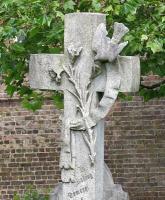 Rose sculpture on the cross . 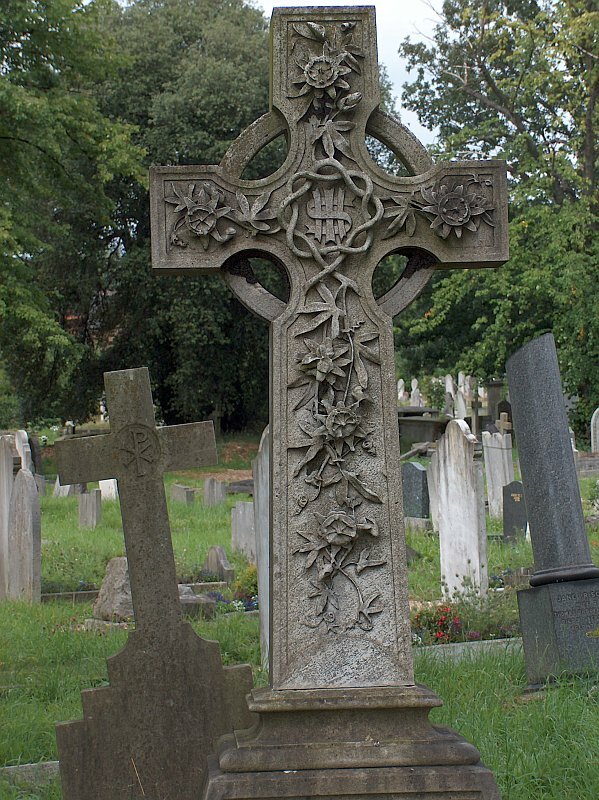 Another flower found extremely widely on the cross is the passion flower, with its complex, distinctive flowers and pentadactyl leaves. 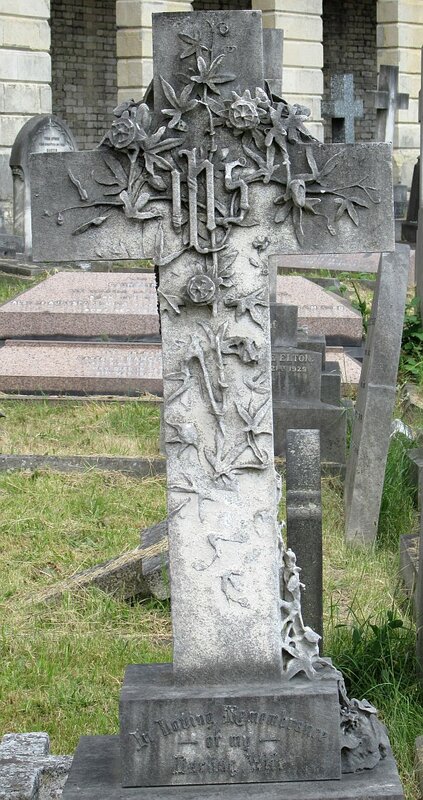 The passion symbolised is not the physical passion of the living for the deceased, but the Passion of Christ on the Cross, with the various parts of the flower supposed to represent various elements of the crucifixion - the stigma are the nails on the cross, the crown as the crown of thorns, and so on. 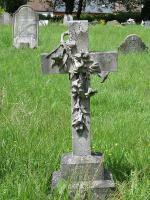 It is thus a particularly appropriate flower to have on a cross or crucifix monument. 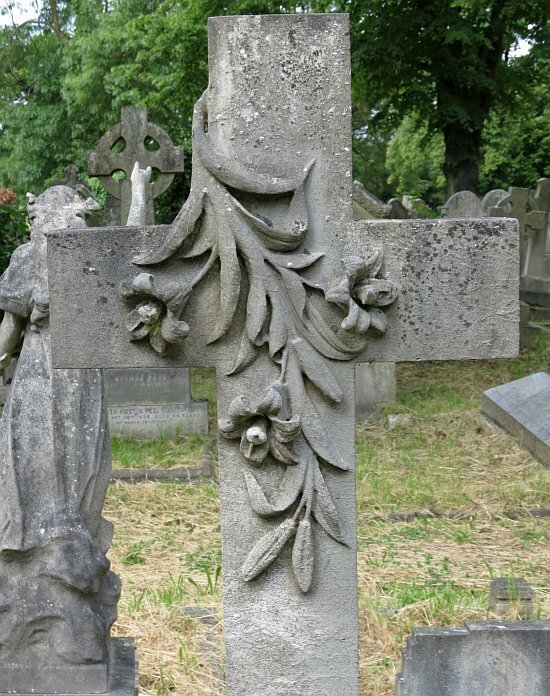 However, of all the types of flower that are found on cemetery monuments, the most popular seems to be the lily, symbol of purity, sometimes grief, and in Catholic iconography, the Virgin Mary. 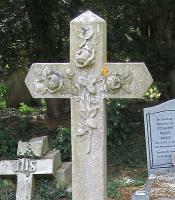 There are two main compositions: either the plant hangs over the side branches of the cross and downwards, as in the three pictures below left; or grows up the shaft of the crucifix with the flowers near the centre and top, as in the three to the right; the central one combines the two, with the plant growing upwards, but then the flowers hanging down over the arms of the cross. 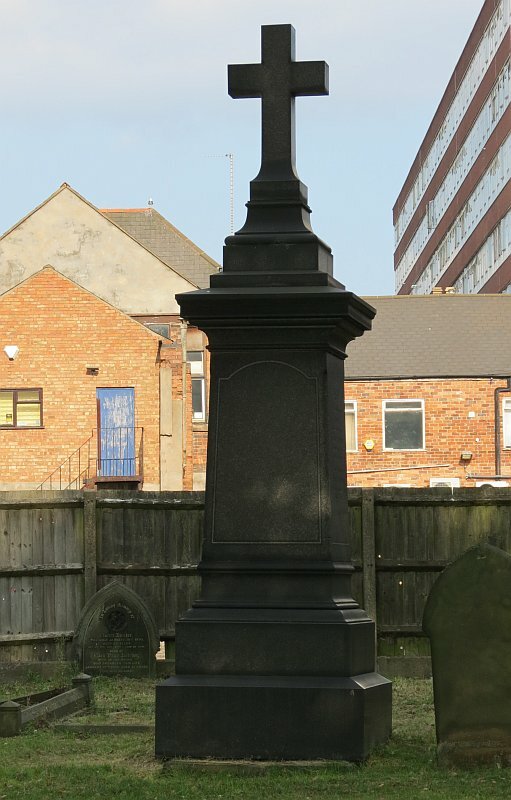 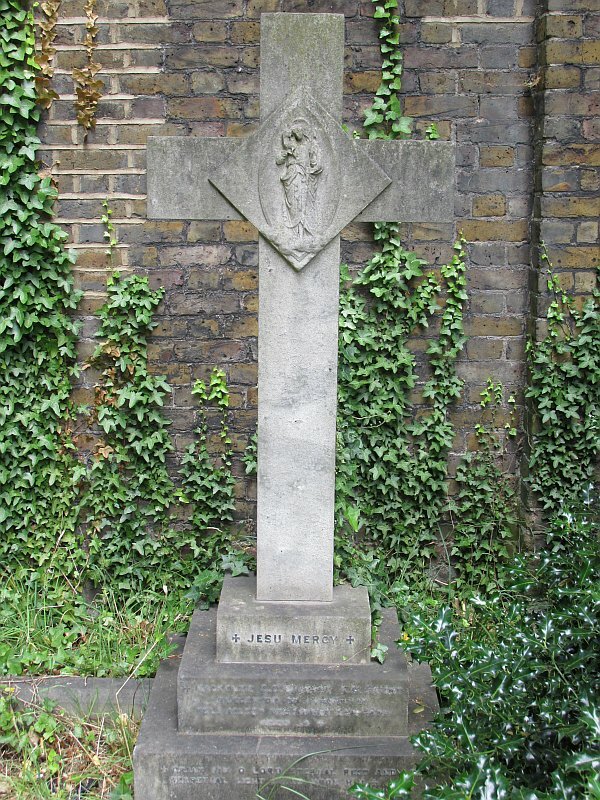 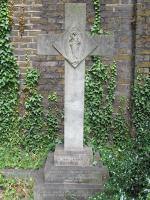 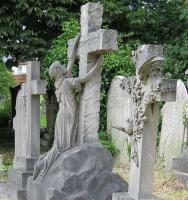 The lily in sculpture on monuments with crosses . 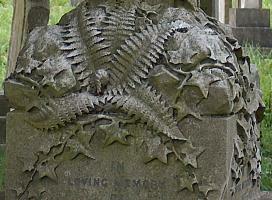 Many other flowers and compositions are possible of course, and here are a few. 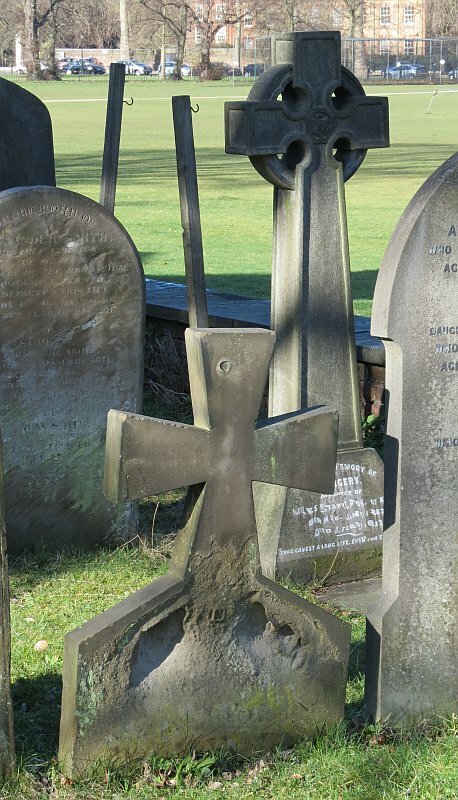 Below left are two examples with a crown of thorns, one in relief, the other looped about the cross, which refer of course to the crucified Christ. 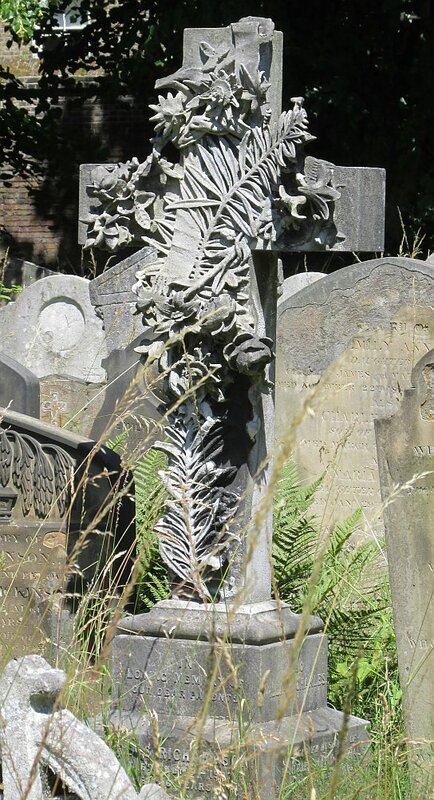 Next, a crisp early 20th Century cross with grasses growing up the shaft to form a repeating pattern with a fine contrast of light and shade in the evening light. 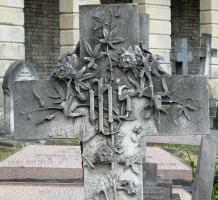 Then a worn, broken crucifix, where the flowers appear to be a mixed group of roses and lilies. 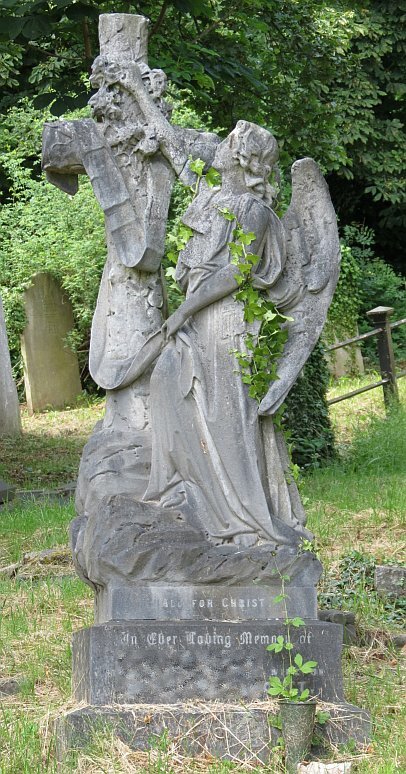 And to the right, some distinctive seeds, podded or enveloped by some curled leaf, and tied in a bunch, representing perhaps the harvest of the soul to heaven. 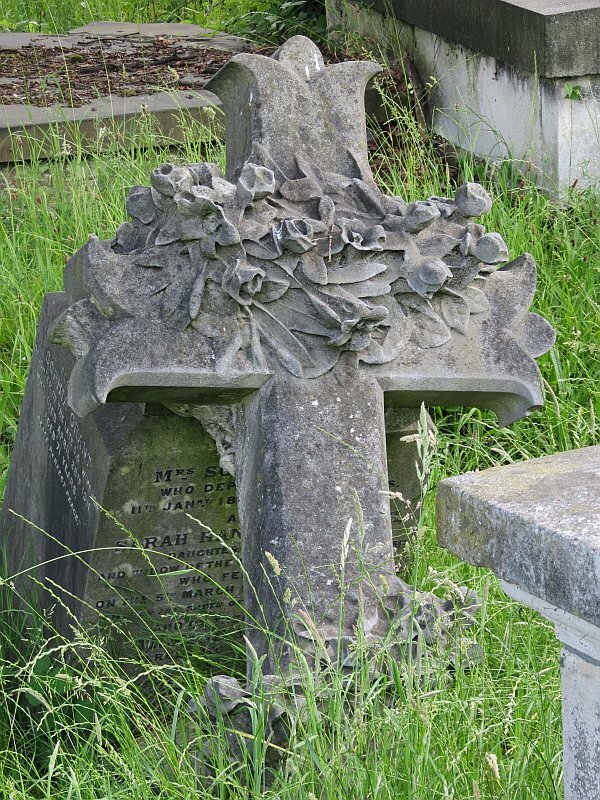 Crown of thorns, grasses, mixed flowers, podded seeds . Before leaving crosses decorated with sculptural vegetation, we should pick up one further group, which are those monuments with what may be described as an excess of plantlife. 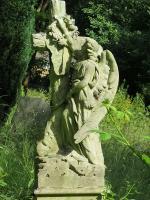 The aim is to give a richness, a sumptuousness of effect, perhaps an allegory of the vigour of renewal and rebirth of life. 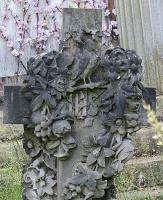 Richness in floral decoration . 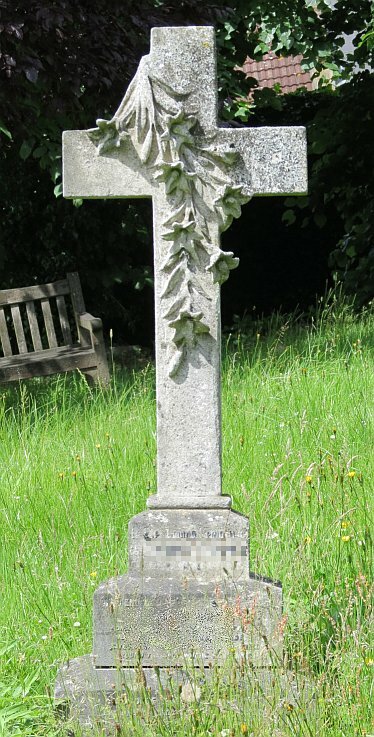 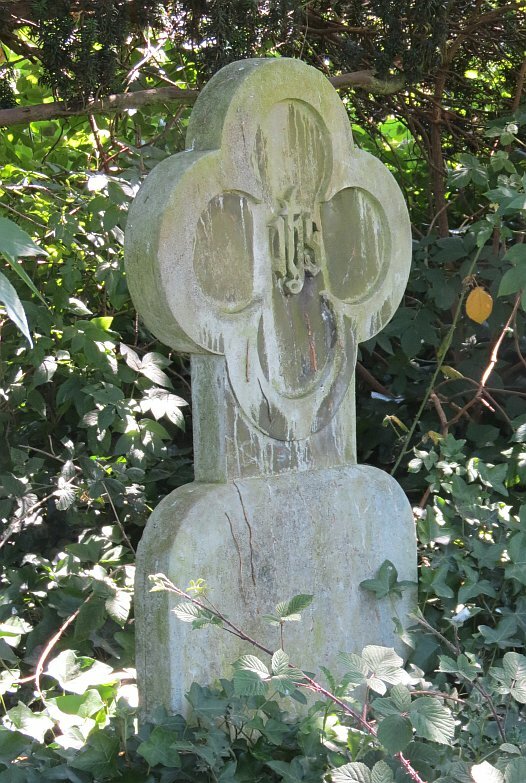 We have seen a couple of examples with birds now, and these adornments to the cross do crop up fairly regularly, being a small embellishment to an otherwise rather standard memorial. 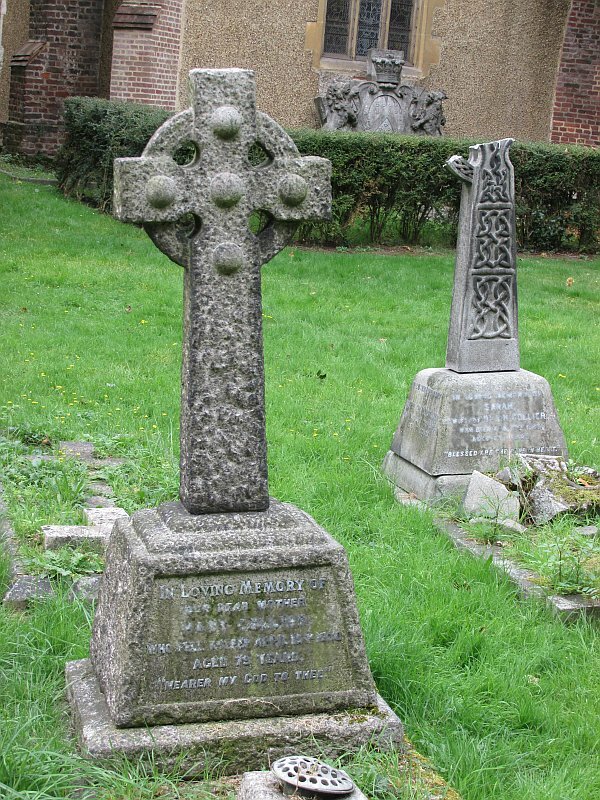 Below are typical examples. 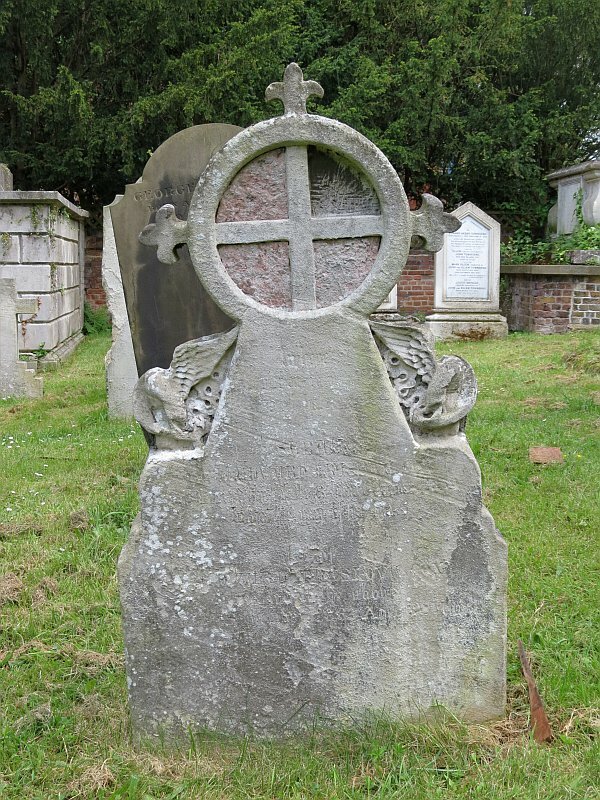 That on the left has the bird perched on one of the arms of the cross, while that on the right has the bird, perhaps a dove in this case, in the centre of the cross, where there is space for a little more width and the opportunity to combine relief and sculpture in the round. 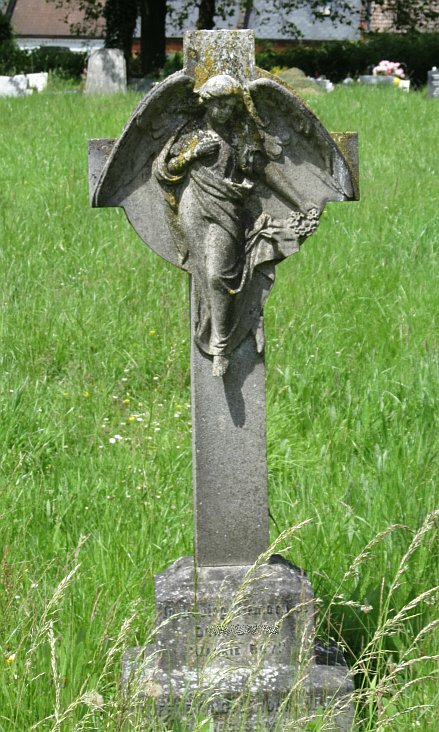 All sorts of symbolism could be linked to such birds, but they are mostly found on more recent monuments, 1870s and later into the 20th Century, and there was less attention to allegory by then, with likely little more than an allusion to benign femininity and the fleeting nature of life, which like a bird, can flutter away at any time. 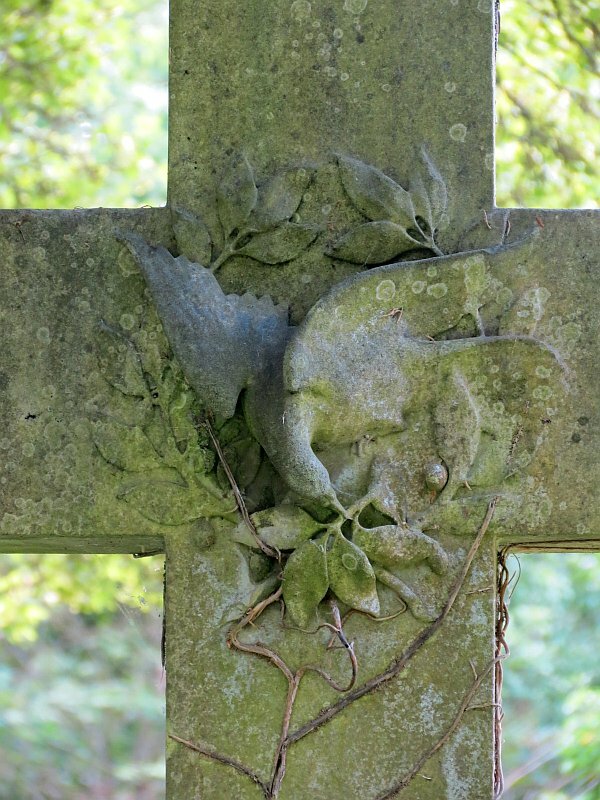 Crucifix memorials with birds . 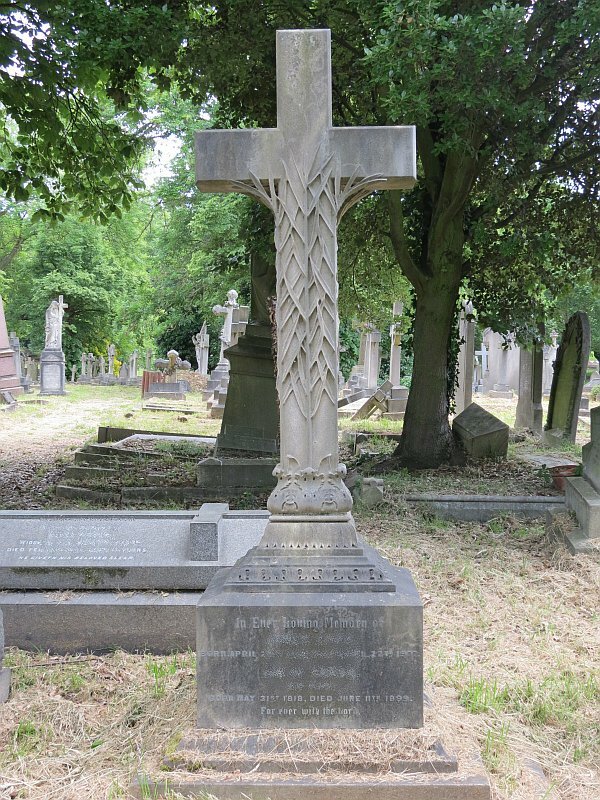 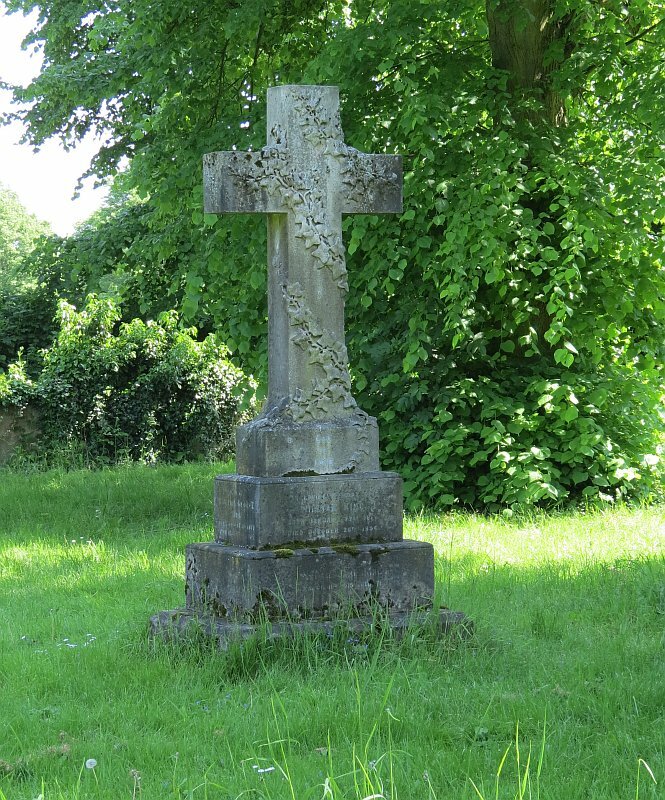 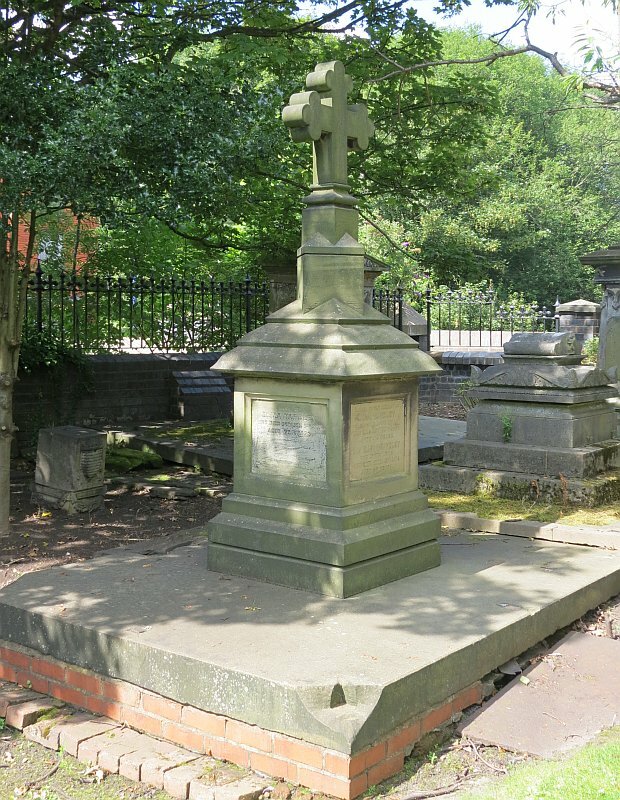 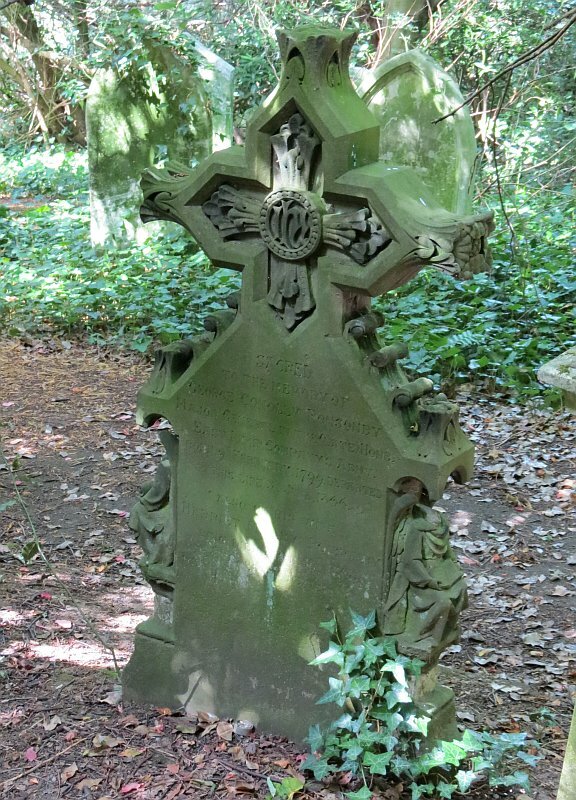 This second example above is one of a whole class of monuments with crosses which have some sculptural adornment in the centre of the cross. 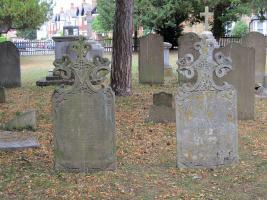 Below left is one with a central lozenge, on which is relief figural sculpture, a Virgin and Child, well composed. 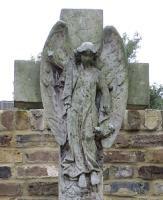 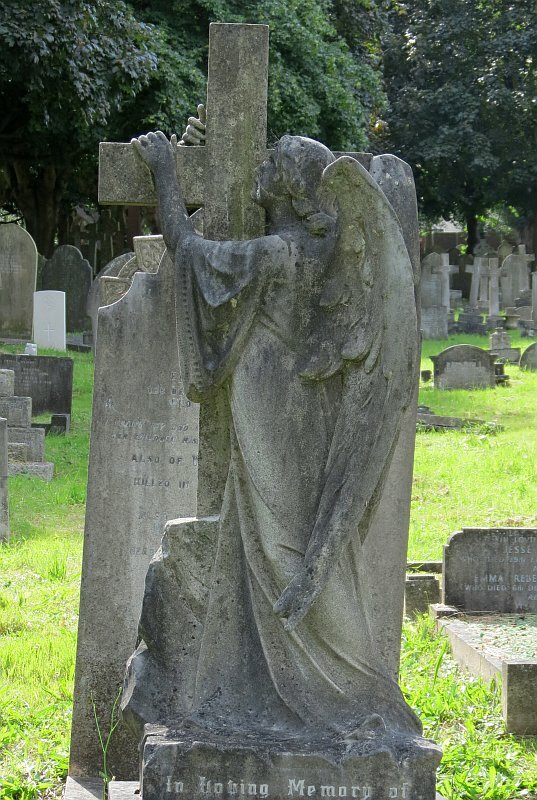 The second example is a small half figure of an angel, a characteristic bit of sculpture from around 1900. The two monuments below right have a small angel pinned to the centre of the cross, a very widely found scheme, including very recent monuments. 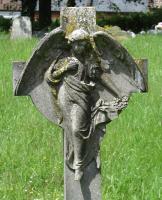 Larger angels and crosses are further down this page. 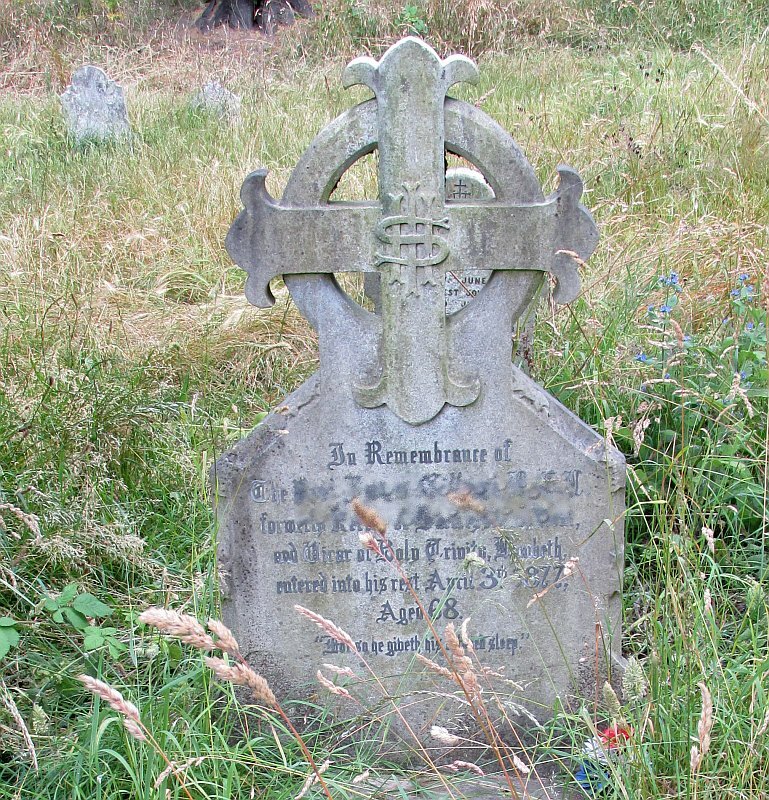 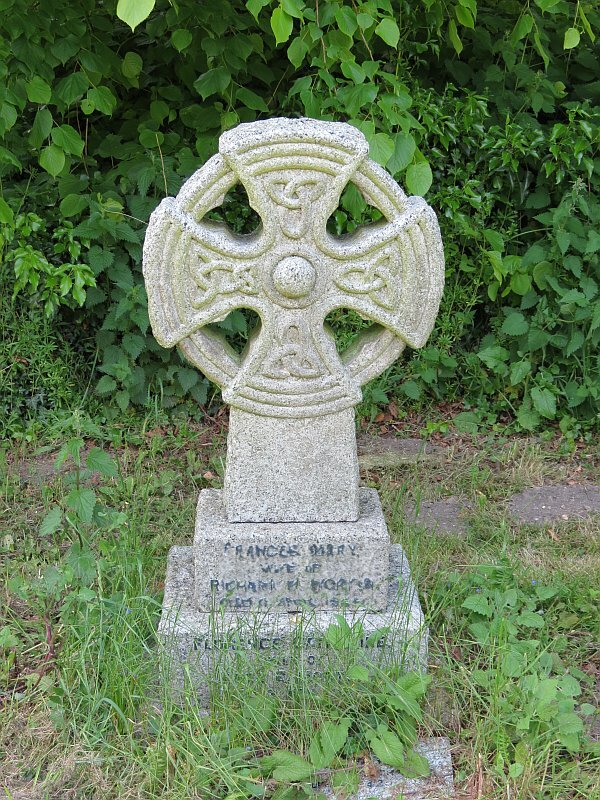 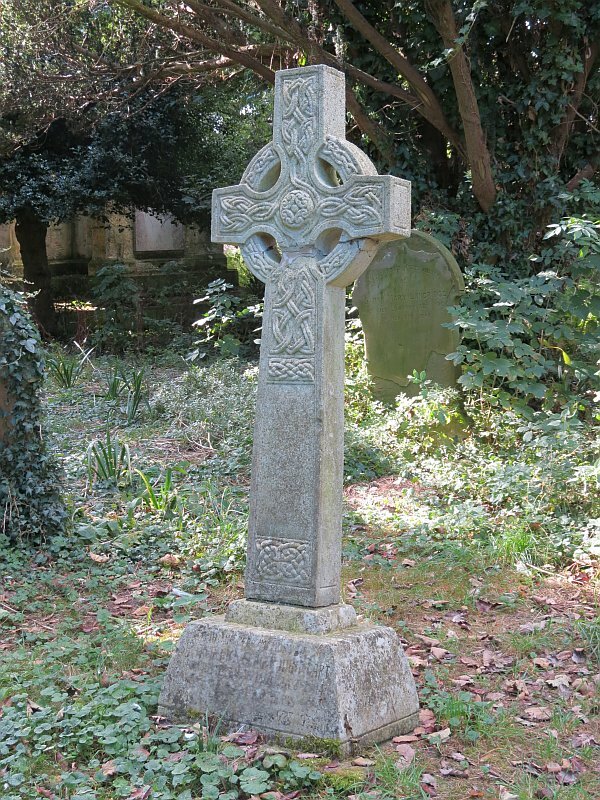 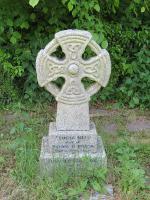 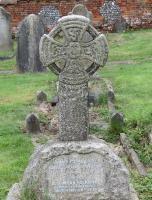 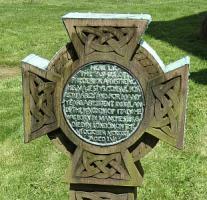 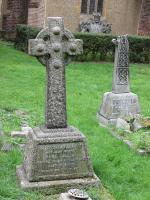 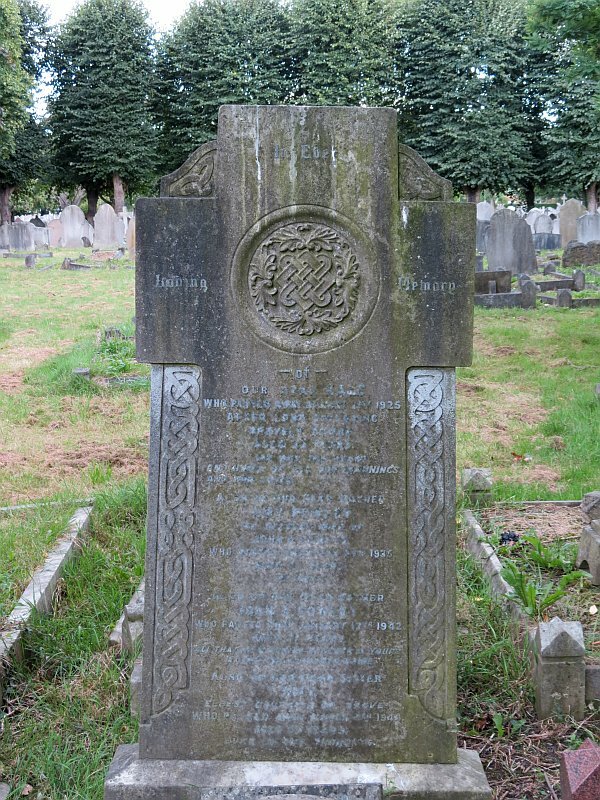 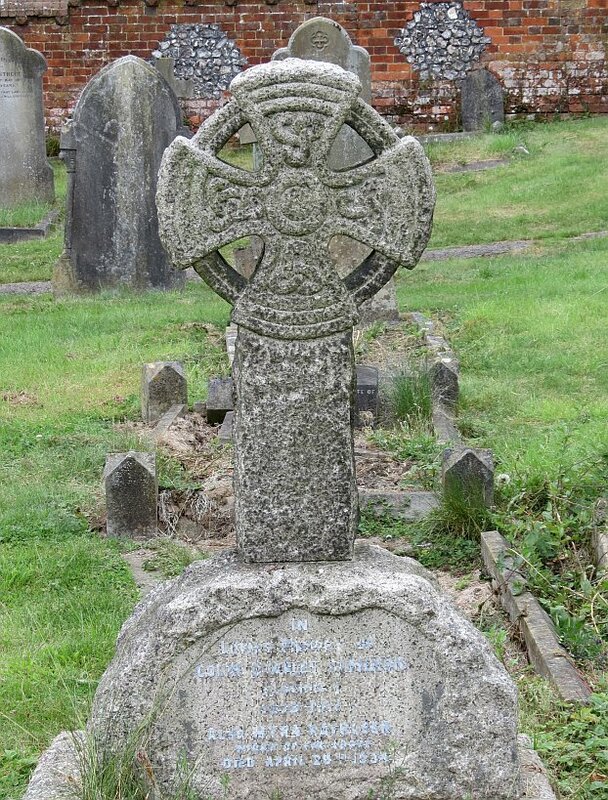 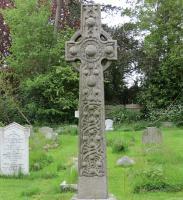 And then another Celtic cross, with lettering in the centre. 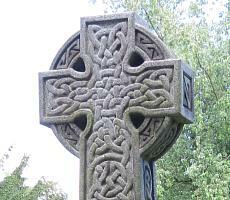 More on Celtic crosses as a type lower down this page. 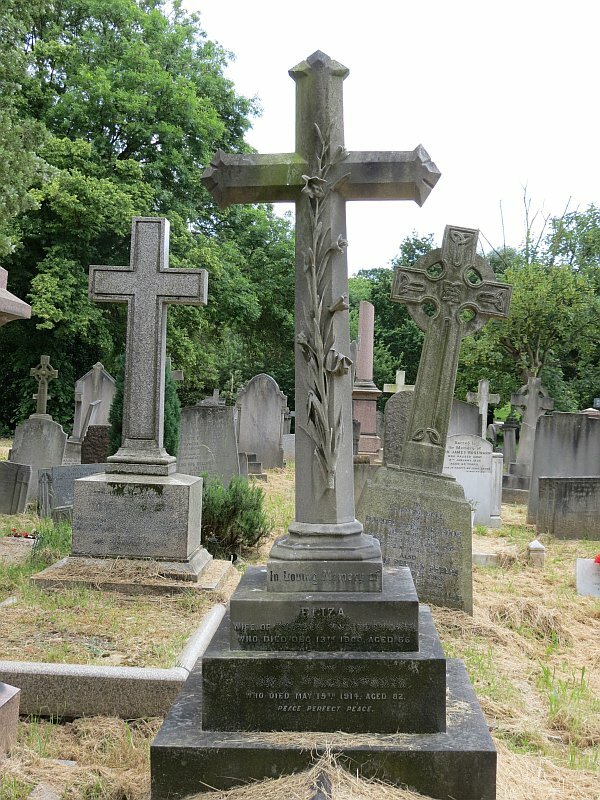 Monuments with sculpture at the centre of the cross . More examples with central sculpture. 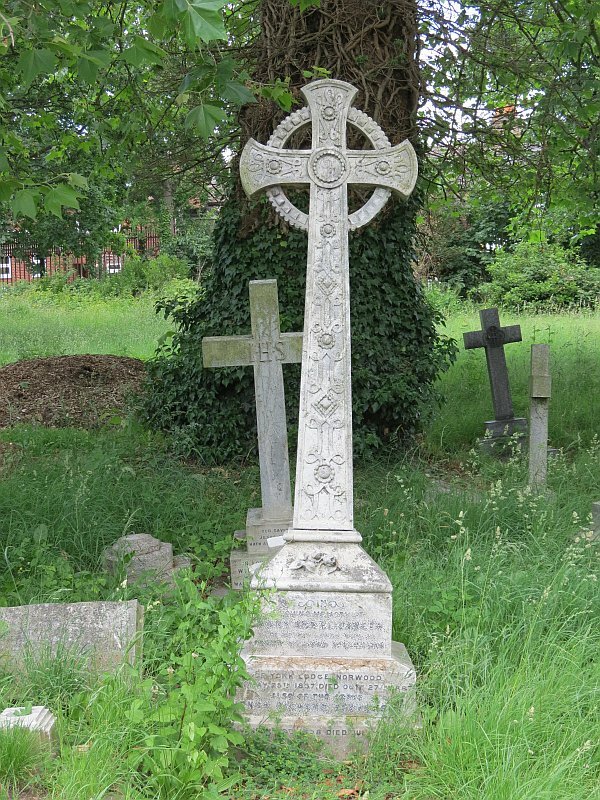 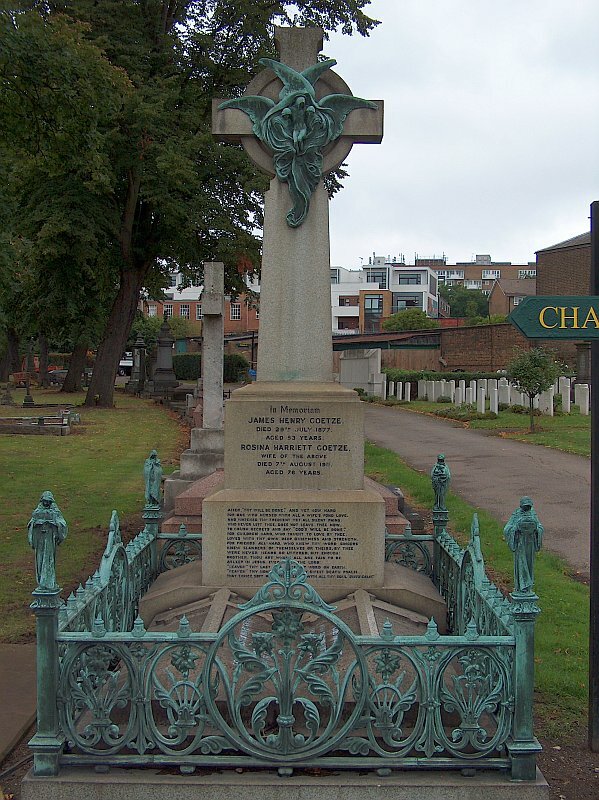 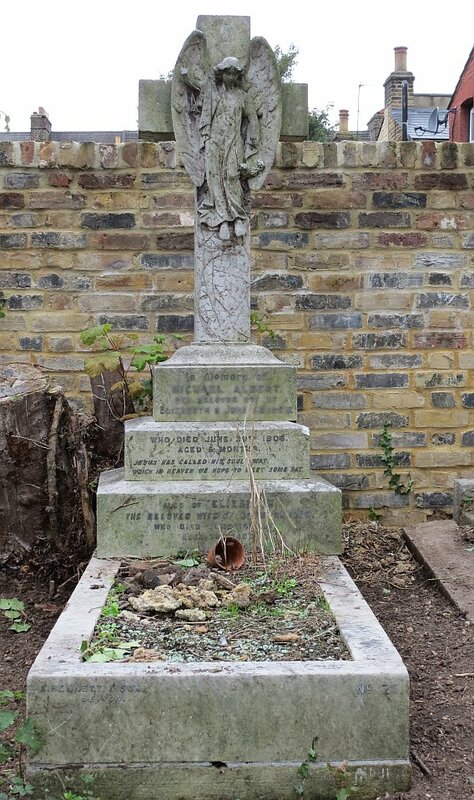 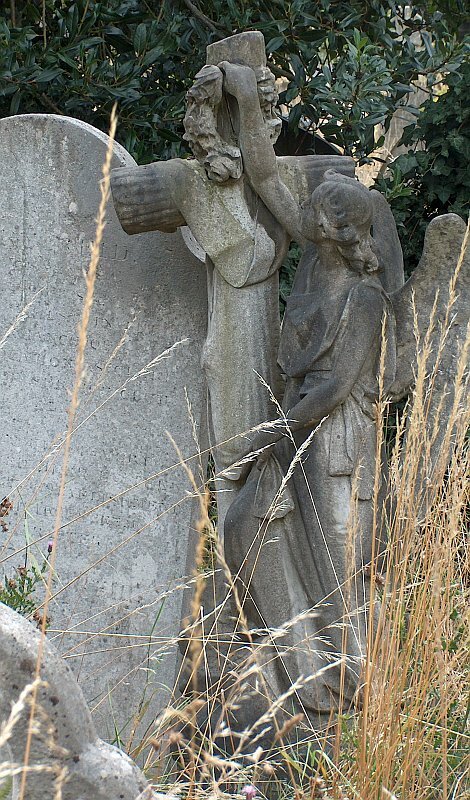 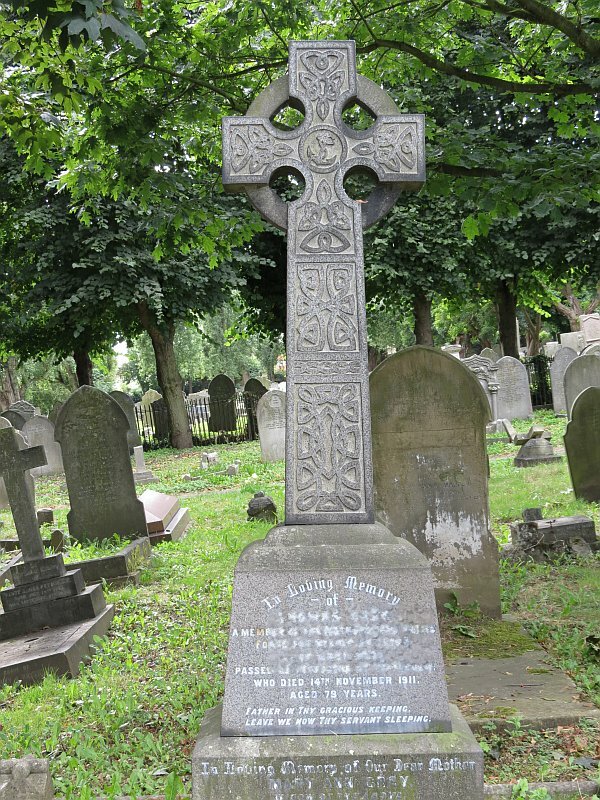 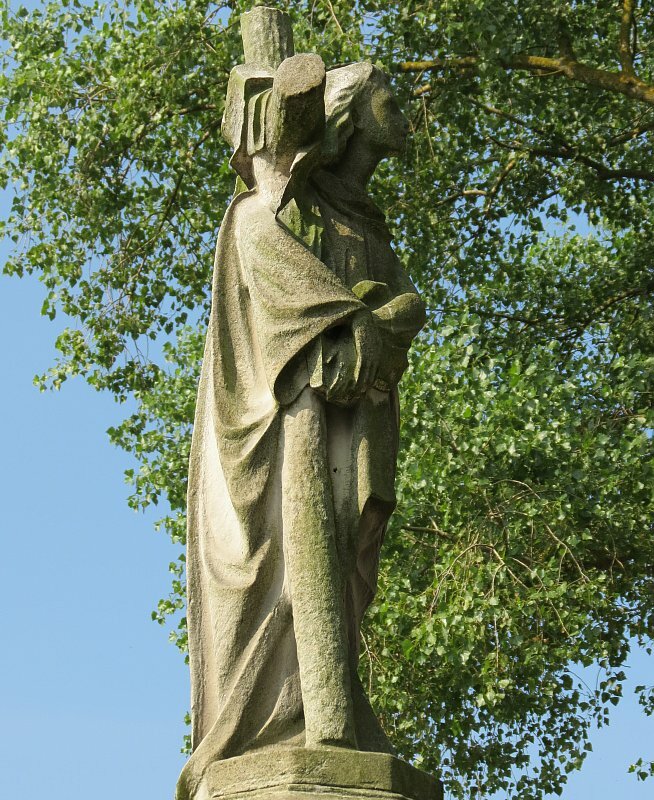 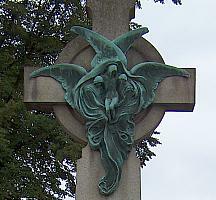 Below left is a distinctive monument in the cemetery at Willesden Green, where the whole centre of a Celtic cross has been filled with a bronze sculpture of a soul being elevated to heaven by two angels. 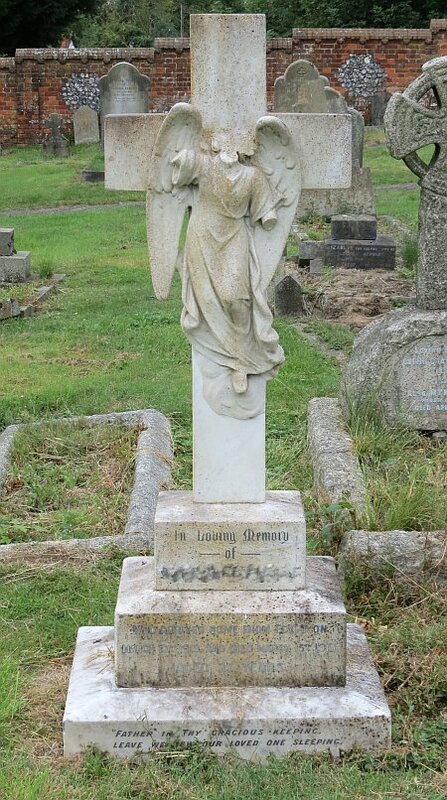 I wanted to contrast this with the next one, which has the angels spread out sideways along the arms of the cross, and the deceased figure all the way down the shaft: thus the composition remains centred at the middle of the cross, but occupies the available field. 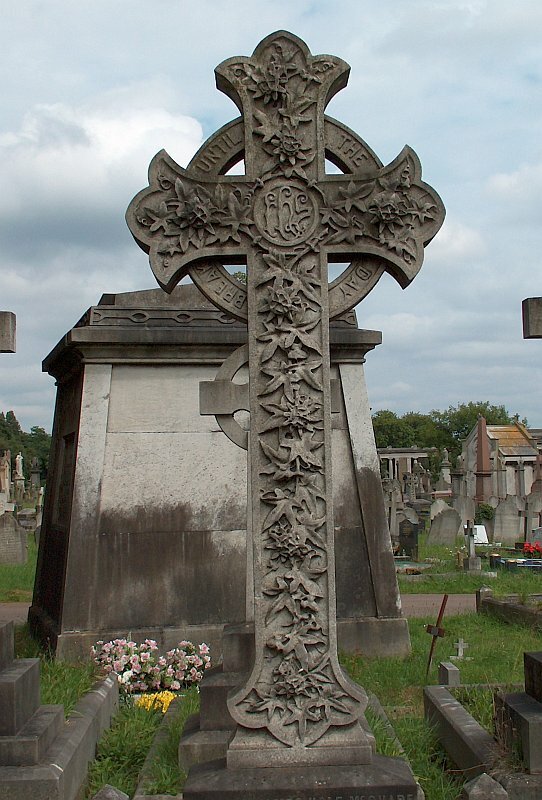 Although floral subjects and angels are the most frequent sculptural ornaments on monuments with crosses, there are others; we exemplify them with monuments to nautical men, which on a cross, means an anchor. 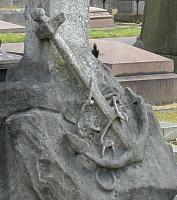 Below left, an anchor is looped around the cross, the rope tied around the anchor itself. 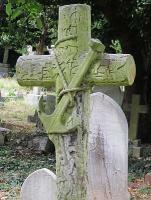 Below centre, the anchor lies at the base of the cross, which consists of a rocky prominence. 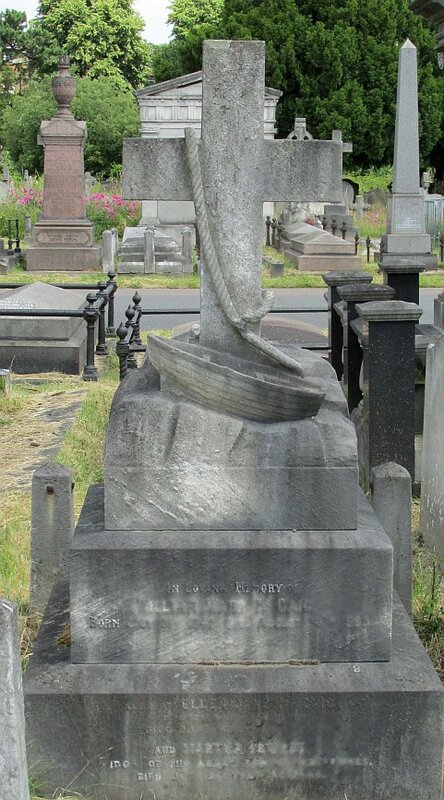 In this position, the cross itself does not limit the sculpture, so that below right we have a similar idea but with a whole boat rather than just the anchor. 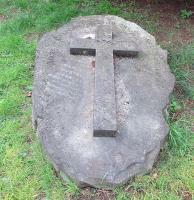 Such bases left rough or made to look like rocks are widespread for monuments based on a cross. To the left is a cross with such a lump of stone, and a scroll to bear the inscription. 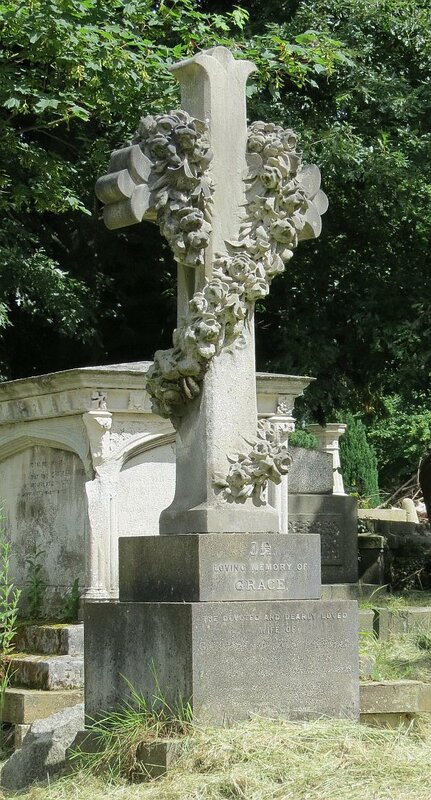 Then a pair of crosses on similar rocky bases but with the inscription set in to those bases rather than as a separate structure. 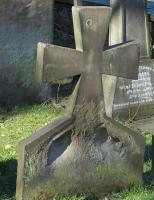 And to the right, an unusual case where the rock extends up behind the cross to provide added support and visual drama. 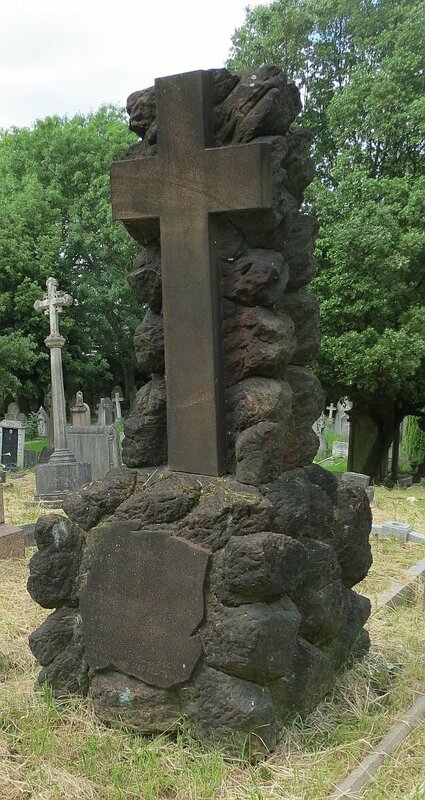 The more formal alternative to the rocky base, if the cross is to be elevated, is a series of steps. 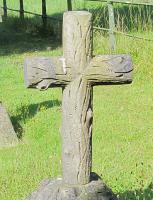 Such a cross raised on a small number of steps is sometimes known as a Calvary Cross. 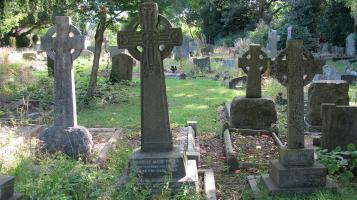 The group below left typifies the breed. The really unusual one pictured next, raised up on a step pyramid, is at Epsom. For some reason, crosses raised on steps draw the attention of the vandal and the barbarian more than most, and there are many cases where the cross has been toppled, and left to lie next to the base. 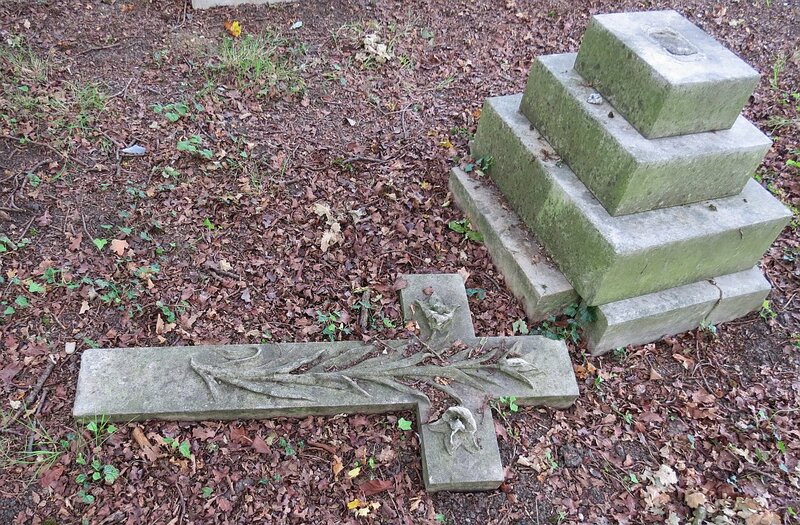 Calvary crosses, a step pyramid, and fallen crosses . 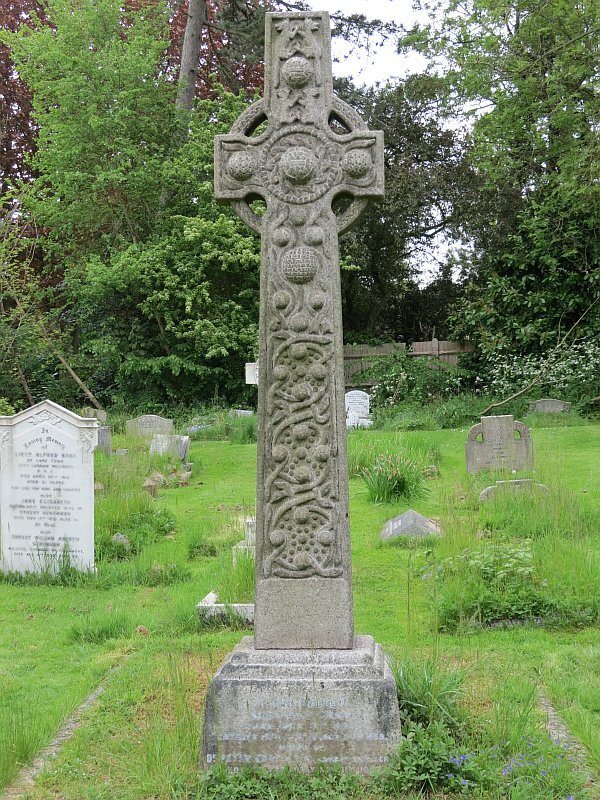 In the various cases above, we have seen a couple of Celtic crosses, thus with with tall shaft, normally square sided, and a ring joining the arms of the cross, forming a distinctive and noble monument, with the advantage of greater strength and thus longevity. 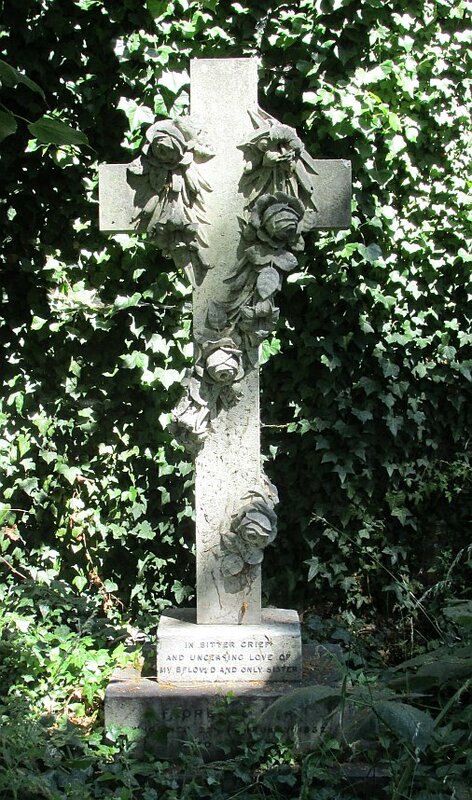 The type particularly lends itself to massive cross monuments, often with heavy relief carving in the manner of wood-carving on chests: again very long lasting. 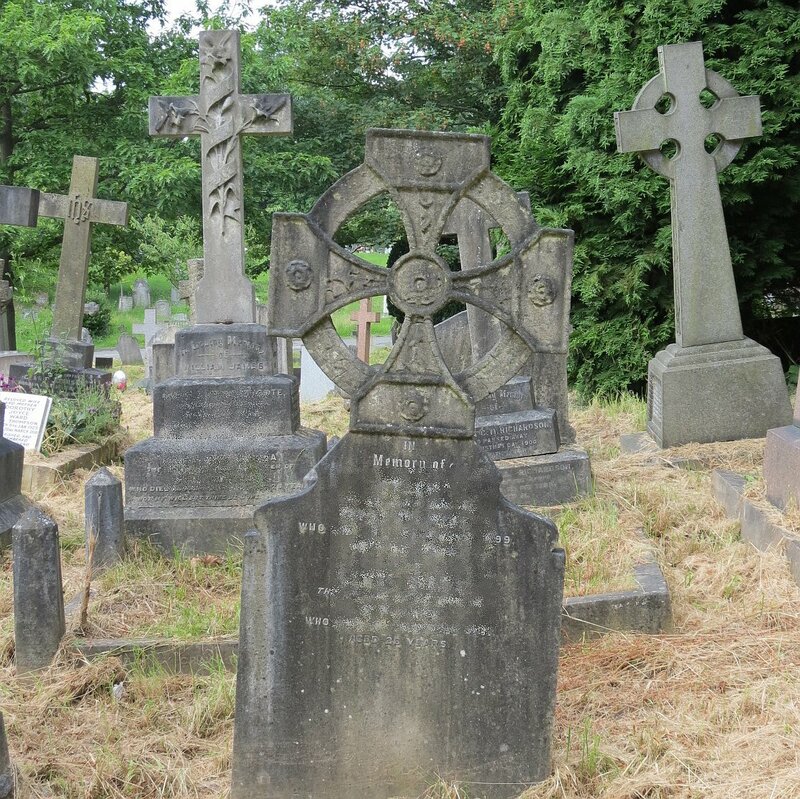 We have here from left, some examples with designs based on vegetation, more or less the same types being favoured as with the Latin crosses. 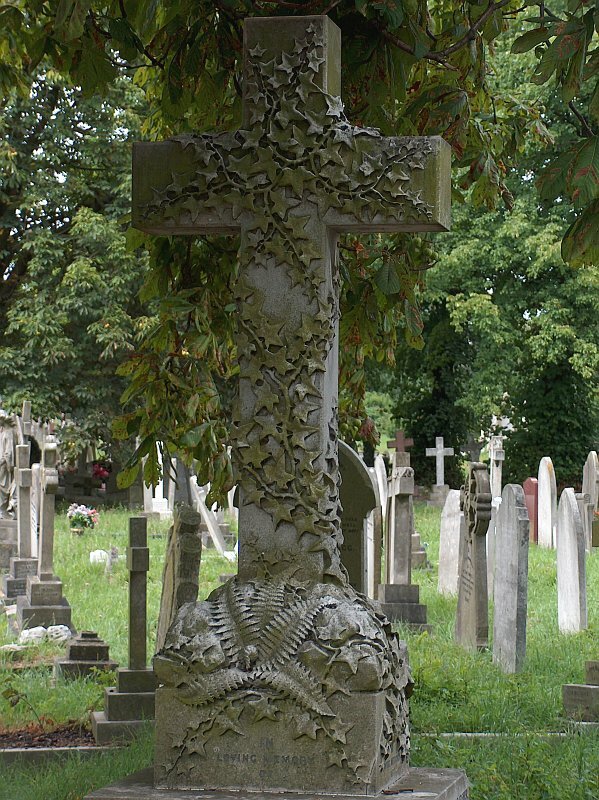 To the left, an early 19th Century floral example, and a later 19th Century design with ivy. 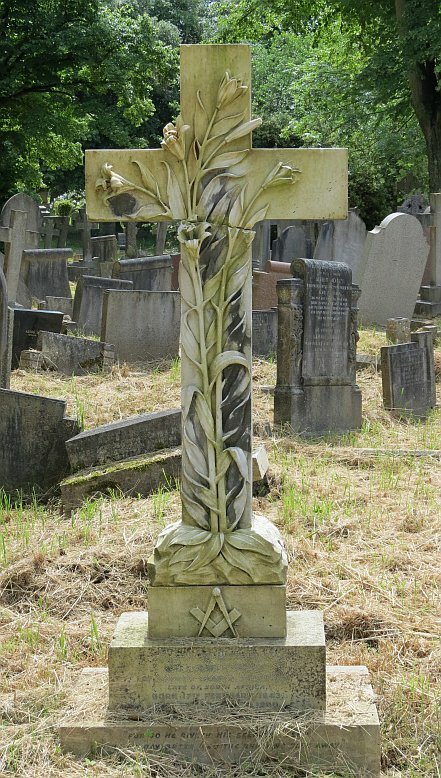 Next, a design with mixed lillies, grasses and ivy, in a bold design well suited to the style. 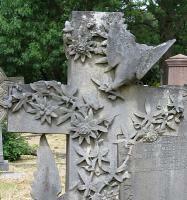 And a splendid geometric design of passion flowers. 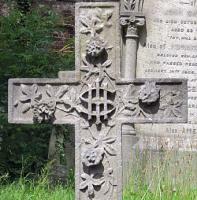 Celtic crosses with flower and leaf designs . 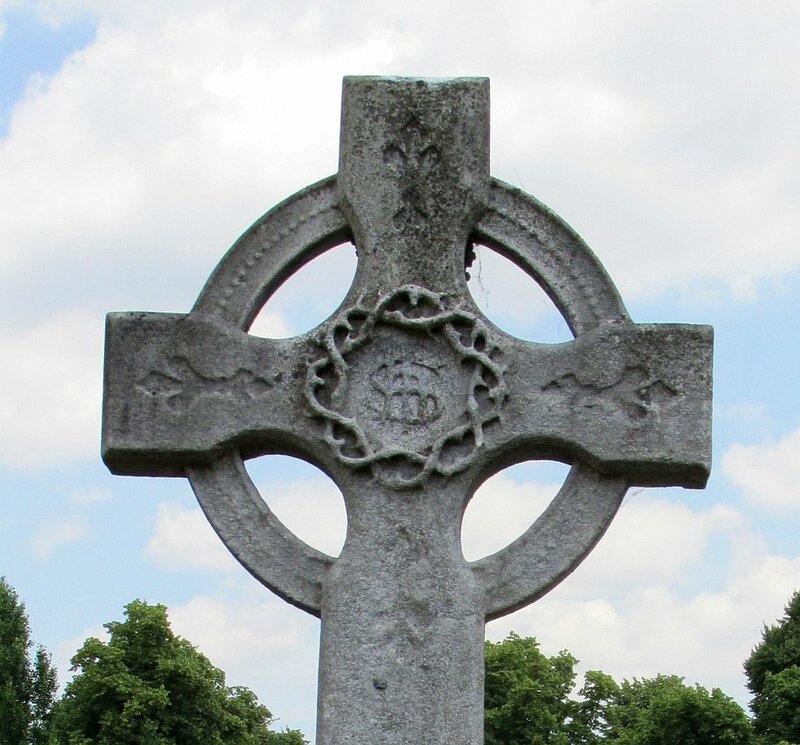 A common feature of Celtic crosses is the inclusion of small balls or bosses, as shown below. 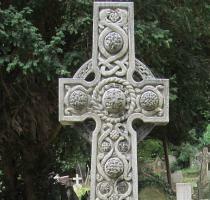 To the left, a pair of crosses with highly worked surfaces, very much in the Celtic tradition, with coiled snake designs, ropes, and the bosses themselves carved with overlapping bands. 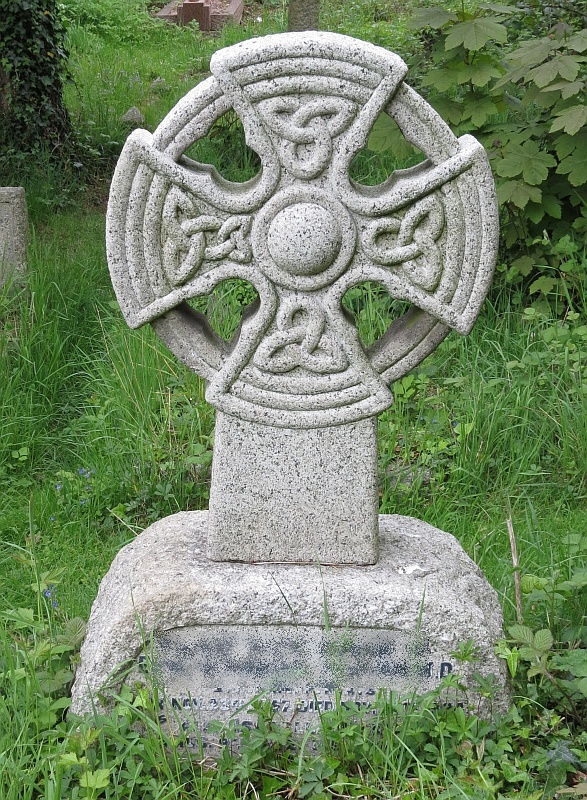 Next, a rough-surfaced Celtic cross of granite, a type which became popular late in the 19th Century and was most frequent in the early 20th; behind that is a broken Celtic cross with fine looping Celtic designs on the surviving shaft. 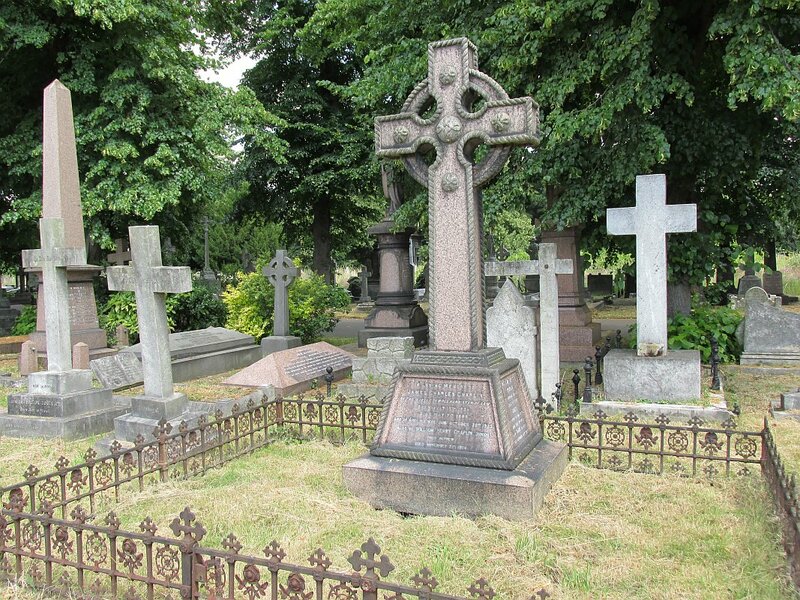 On the far right is a case with the bosses replaced by coloured stones, giving a jewel-like effect. 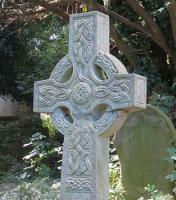 Celtic crosses with embossments . 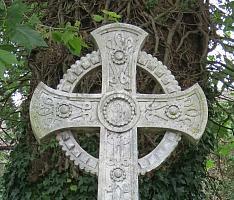 Some variety of Celtic crosses. 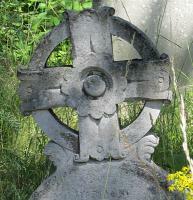 Below left, a toothed circle around the cross, suggesting a gearwheel rather than object of devotion. 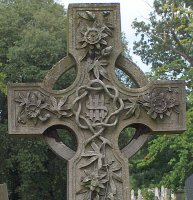 Next, one with little surviving decoration, but a crown of thorns in the centre: an unusual accoutrement for a Celtic cross. 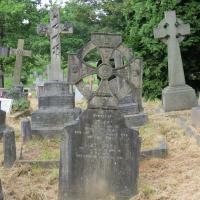 Then an enclave with several Celtic crosses next to one another. 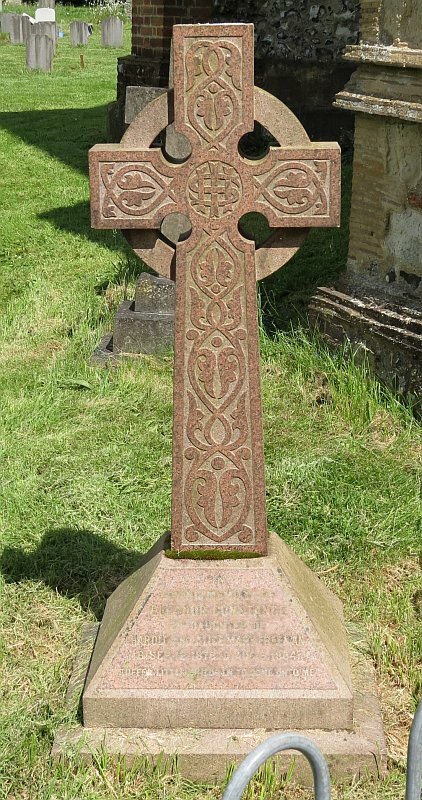 Then a machine-cut late Victorian cross made of red Shap granite, looking almost new despite its 130 year age. 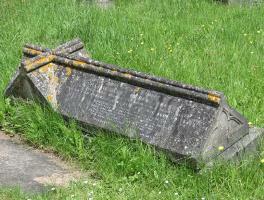 And by contrast, an entirely rough-cut Cornish granite example of similar date. 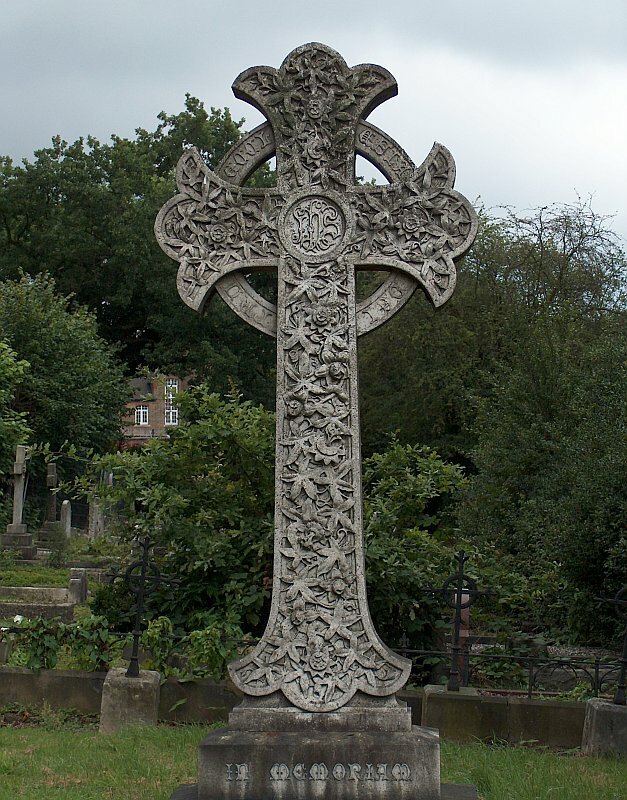 Celtic crosses, low relief carving . 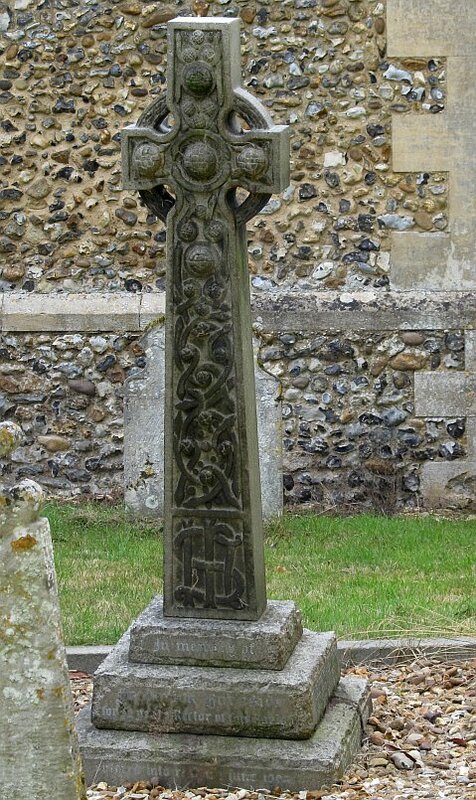 A variation on the Celtic Cross is the Canterbury Cross, which also has a circle behind the arms of the cross, but is a short, stubby shape rather than having a tall shaft. 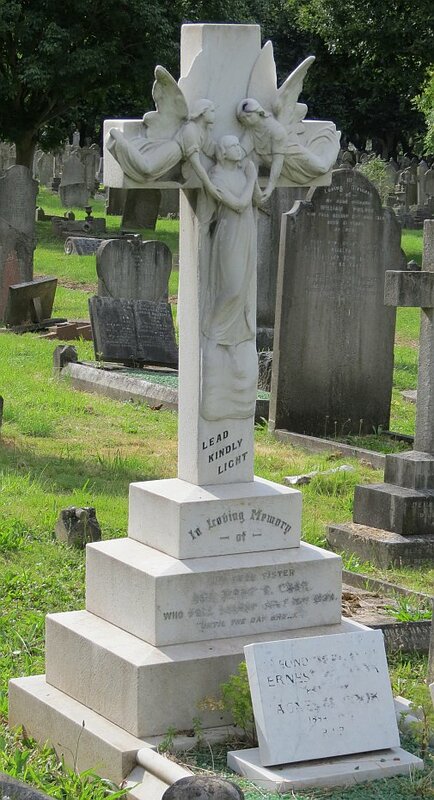 Each arm of the cross is splayed out towards the ends. The Celtic trefoil design, if we may call it thus, is a typical embellishment carved in relief on many if not most of these sorts of monument. 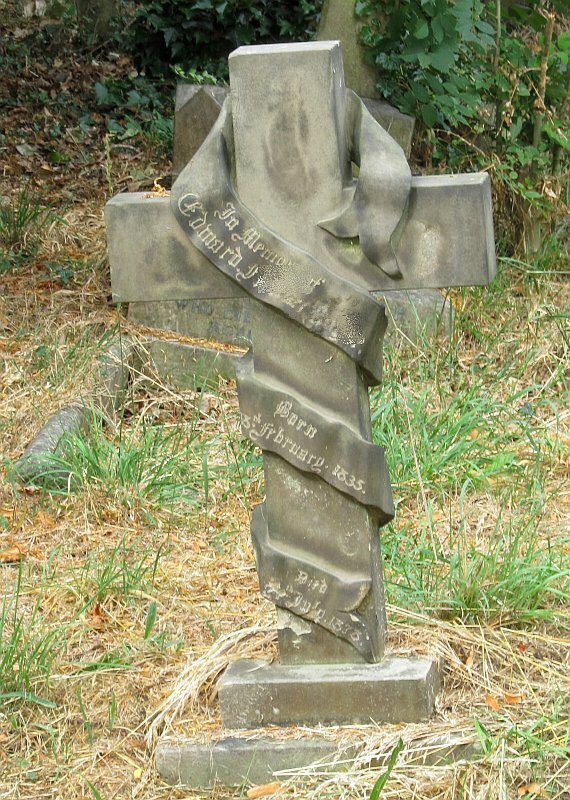 Poorer people who could not afford a stone monument might get a memorial in the form of a wooden cross, and it became relatively frequent in the 19th Century to make stone memorials in the form of crosses looking as if made of two crossed wooden logs - an intrinsically odd thing to do with stone. 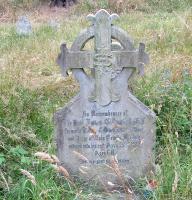 The two below left are typical of the breed, with the inscription on the base. The next one, rather dark against the light behind, manages in addition the IHS inscription in the centre of the cross, and the words 'It is finished' across the arms. 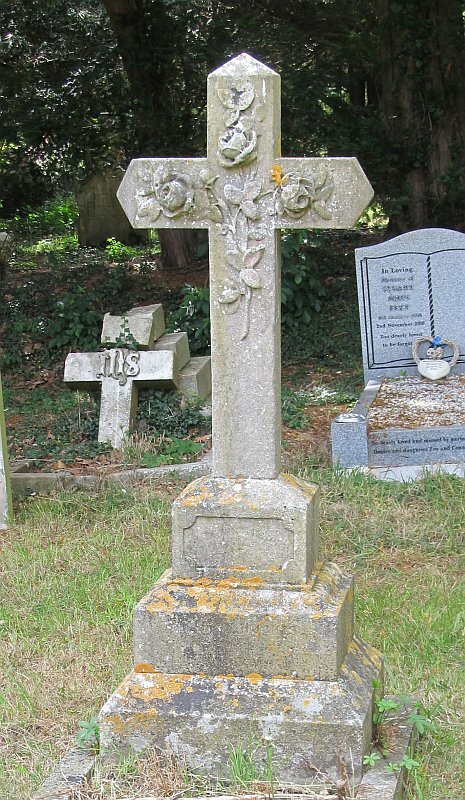 The leaning cross next along has the top deliberately at an angle, a strange affectation to give a more rustic look. 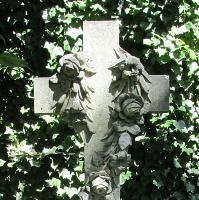 The one on the right, unusually, has a floral decoration of an ivy wrapping itself around the shaft. 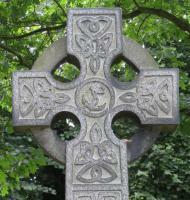 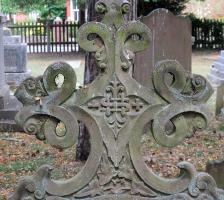 A different style of cross is where the cross has each branch split into rounded ends, like a trefoil. 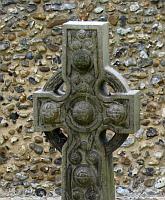 This is sometimes called a budded cross, or in heraldry would be a Cross trefly. 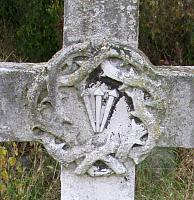 The first example below, in red granite, has central baubles or bosses to each trefoil. 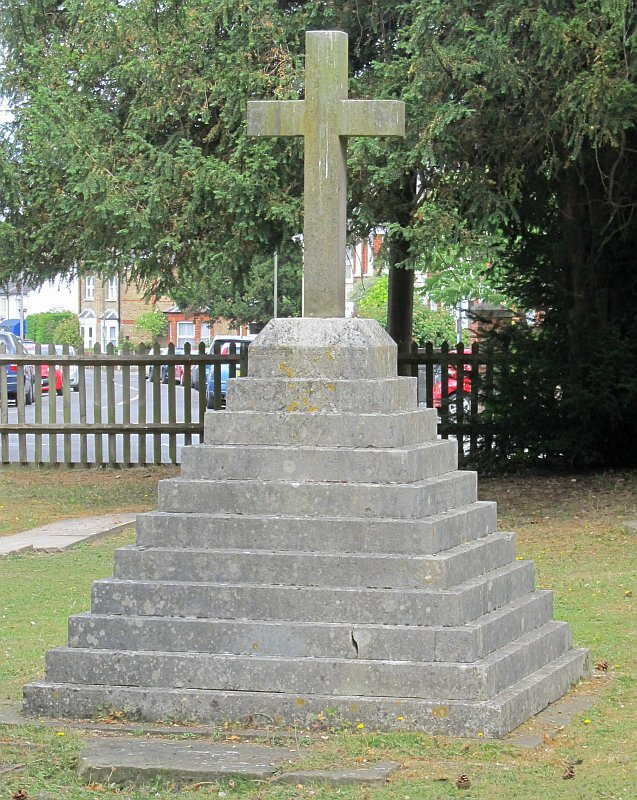 The next one has the cross as a summit to a square-sided monument, rising through several stages: it could as easily have been a draped pot. 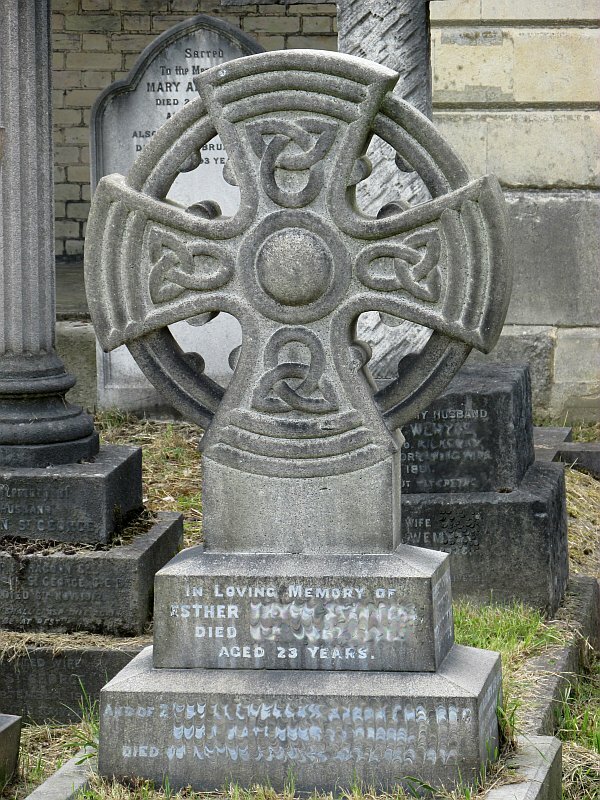 Next, a short cross like a Canterbury Cross, with quatrefoil inside the circle, and the bars of the cross itself plain bar for the text 'In Memoriam'. 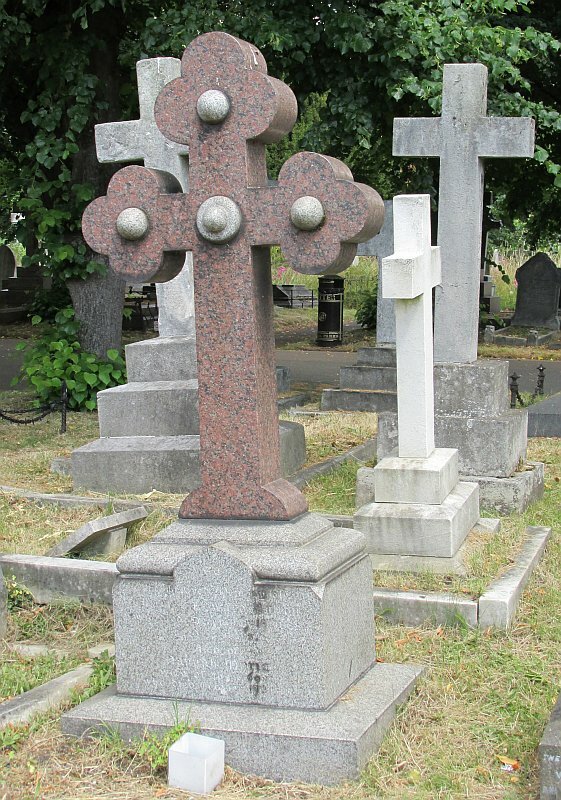 And to the right, a conventional Calvary cross on steps, with lightly decorated shaft and arms, and the trefoil ends almost an afterthought, though helping the design to convey an unusual lightness. 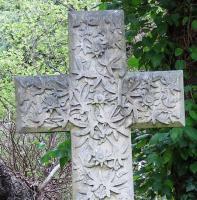 Crosses with trefoil ends (Cross trefly or budded cross) . 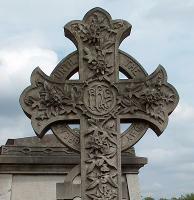 Returning to a normal cross, an alternative to the trefoil-ends to the branches, if the branches split into three parts, which angle round and back in the form of a fleur-de-lys, then we have what in heraldry is termed the Cross fleury. 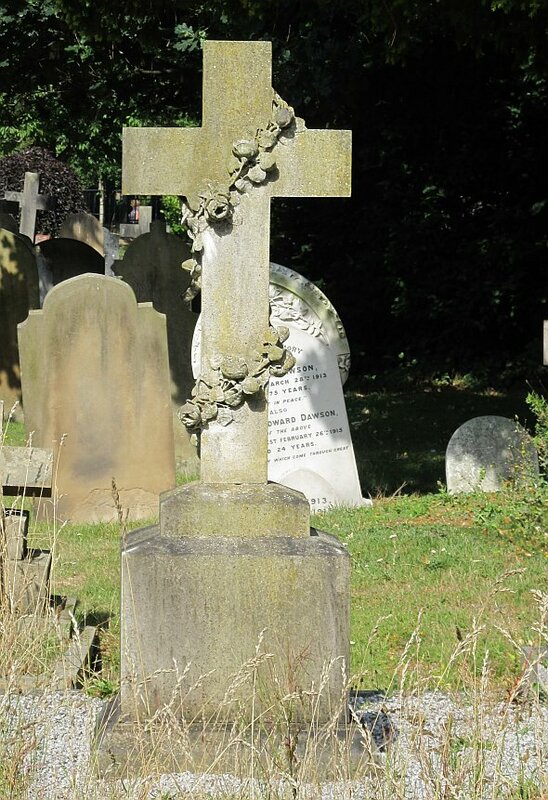 These are moderately popular in different variants. 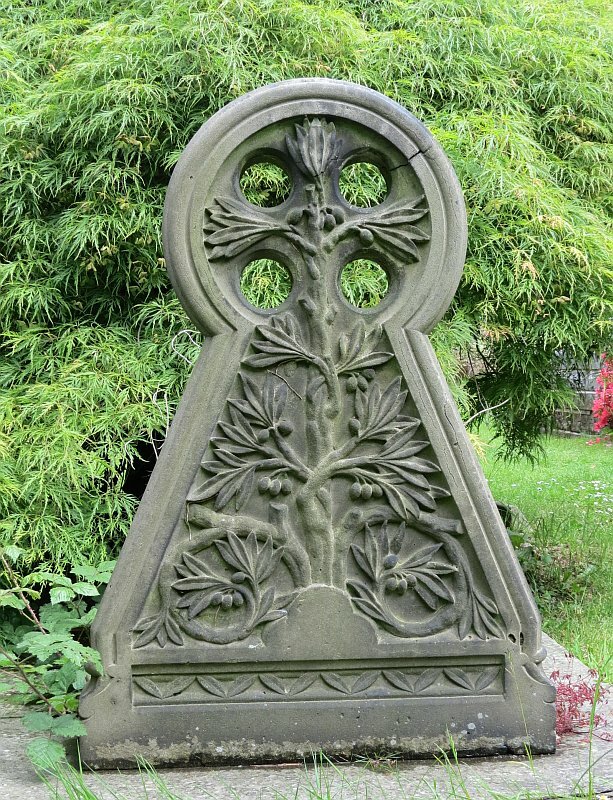 Below left is a grand Celtic cross fleury, embellished with complex leafy designs, passion flower in this case. 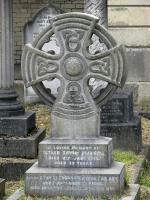 Then a Latin cross fleury with a boss of polished stone; a conventional Gothic slab with a cross fleury upon it in high relief; a cross fleury with a small figure carving in the centre; two short crucifixes on top of slabs, the second of which has sculptural decorations below the cross; and another Celtic cross fleury rather similar to the first example. 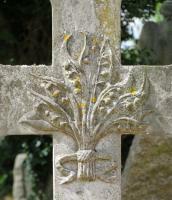 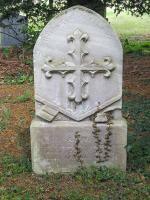 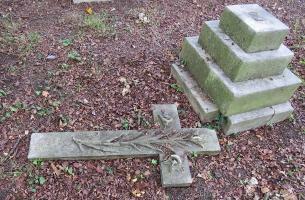 Cross fleury monuments (fleur de lys at ends of branches) . 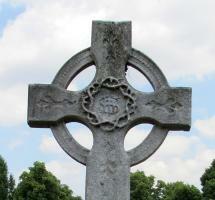 Cross crosslets, and other varients of the Crucifix . 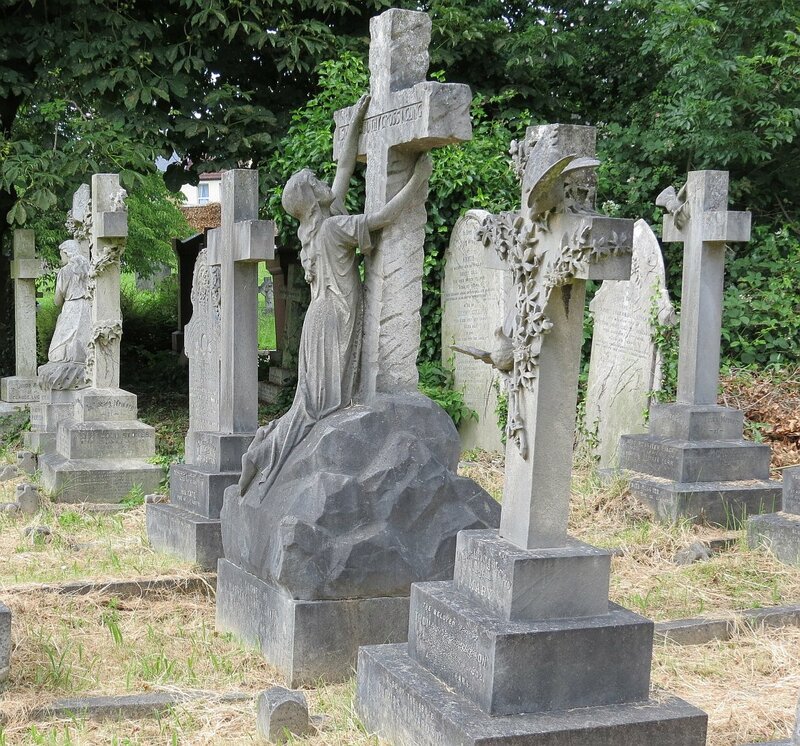 And now we return to crosses and angels, of which there are a plethora. Usually the focus is on the angels, and there is a page on this site concerned with them, and there is of necessity some overlap, but here we particularly consider their place with crosses. 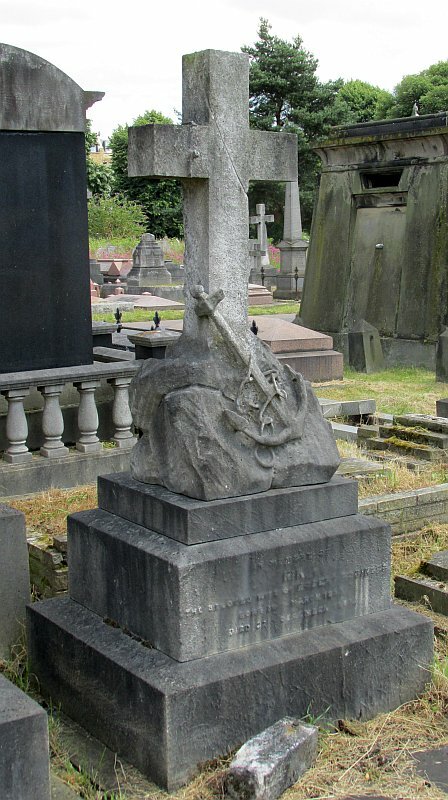 Below left is a very typical one, in this to a soldier fallen in World War I, with a medium-sized flying angel pinned to the centre of the cross. 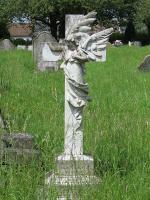 Next, a larger one, angled to one side. 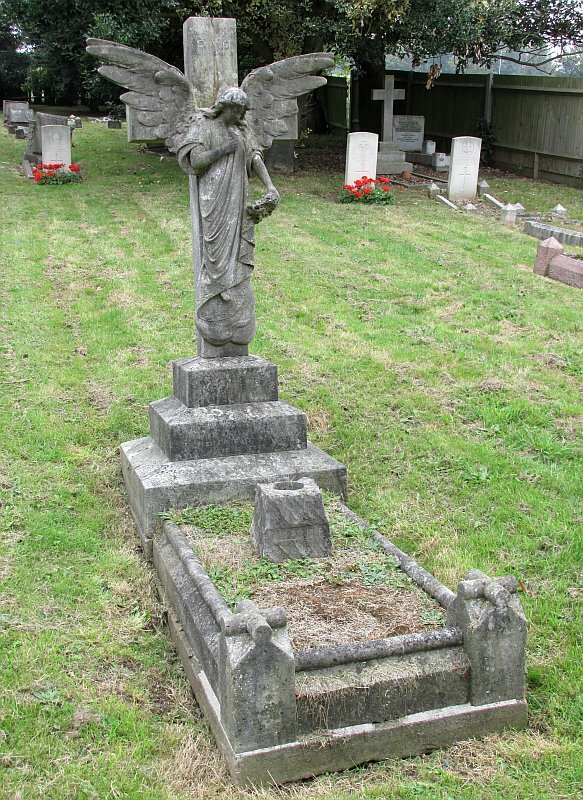 And a third one, more symmetrical in the placing of the wings, again very typical of such monuments: she appears floating rather than flying, bare footed, lightly and harmoniously draped, with open sleeves on a chiton-like garment gathered on a belt worn high under the breast, one hand over her heart, the other, now lost, raised in benediction. Next a standing angel, holding a trumpet, with flowing drapes covering the base of the monument. 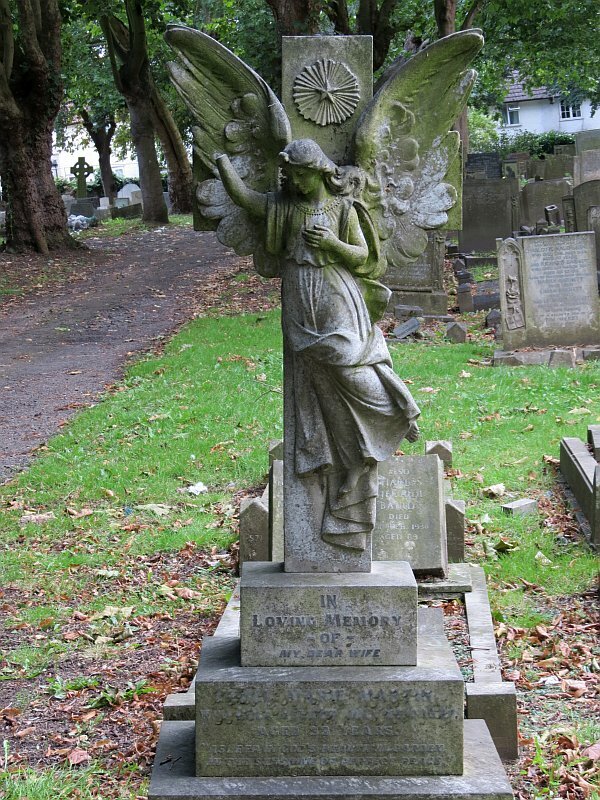 And to the right, a smaller angel standing in front of the cross, here with downcast eyes in mourning, and holding a wreath. 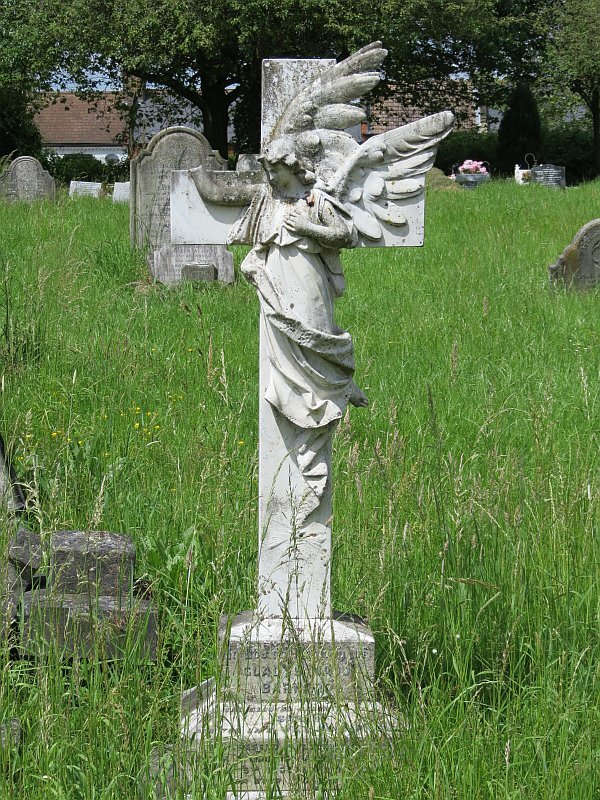 The final one is a youthful figure of an angel, hand raised again, and holding a sprig of lilies, hearkening back to the simple floral crosses we met near the top of this page. 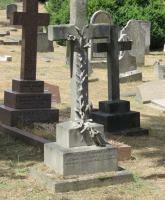 Crosses with angels in front . 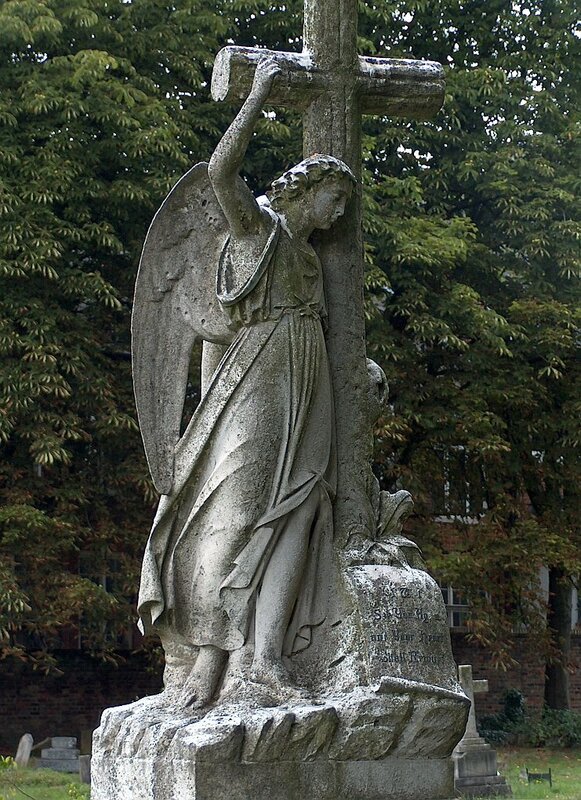 Rather than flying or standing in front of the cross, our angel can hold on to it, uniting the two elements of the composition. 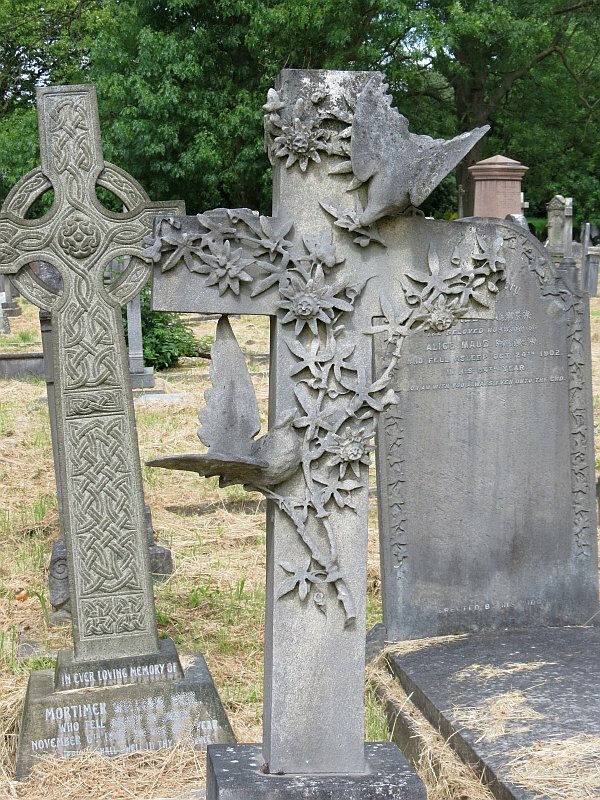 Below left is such a standing angel clasping the cross, which is of the crossed-branches type, covered with loose bark or perhaps ivy in a repeating pattern. 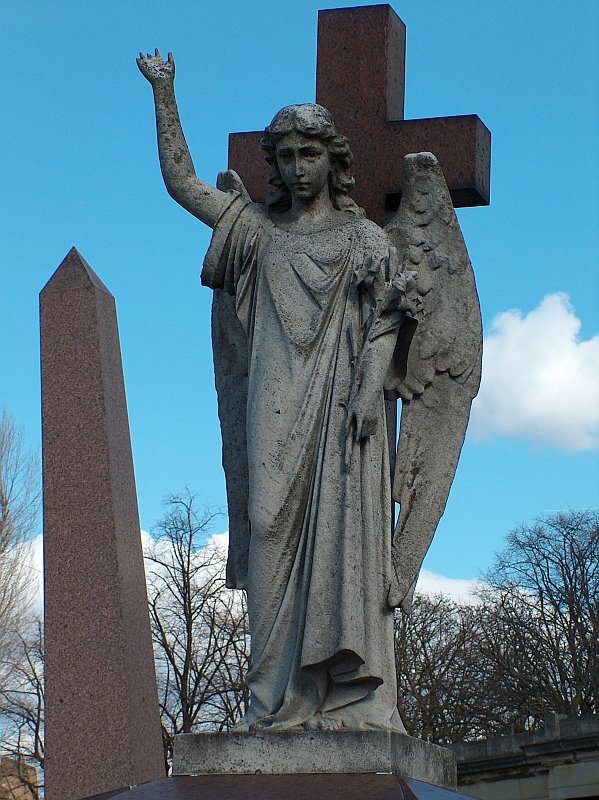 Then two posed almost identically - I have seen many in this particular stance - stepping up, holding a wreath against the cross, the other hand holding a ribbon or cloth looped round the shaft. 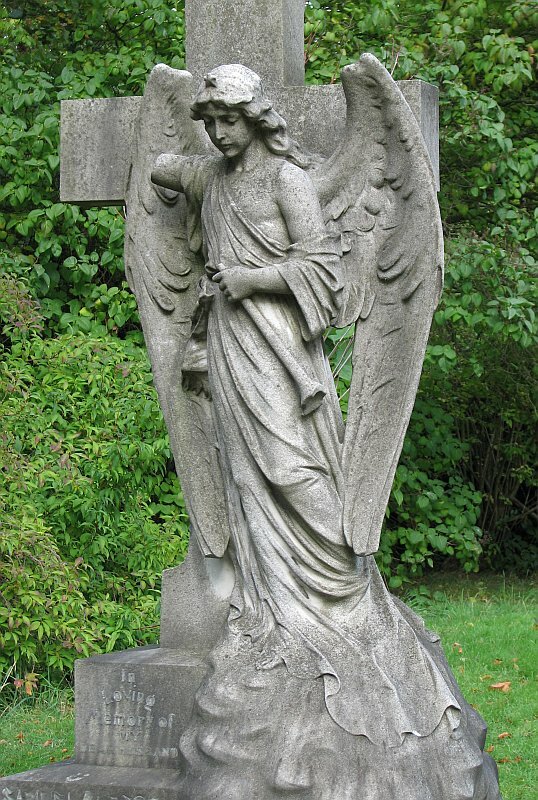 The pose gives a dramatic side view of the angel and exposes more of the cross than more symmetrical forward-facing compositions. 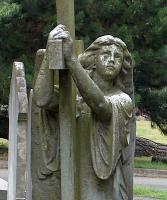 By contrast, the next example is much calmer, with the angel leaning against the cross, one arm embracing it, the other raised. 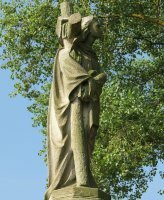 Only the sweep of the drapery across leg and thigh gives a sense of movement in an otherwise static scene. 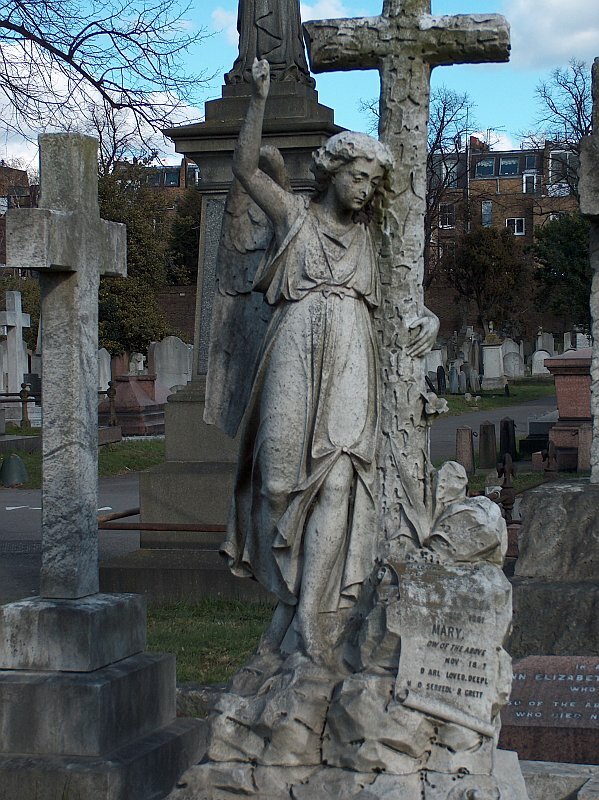 Next - indistinct in the small picture so you need to click to enlarge - is an angel turned towards the cross, about to place her wreath upon it. 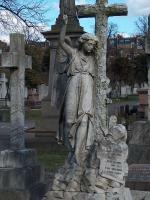 And to the far right, two examples where the angel has her hands around the upper arm of the cross, clasping it to her. 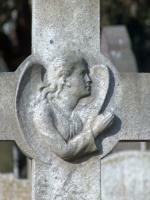 Crosses being held by angels . 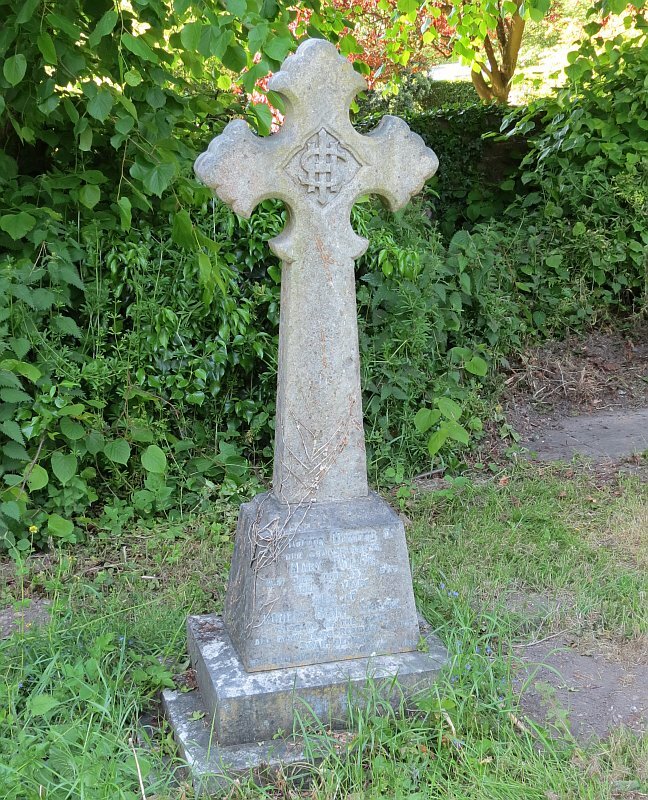 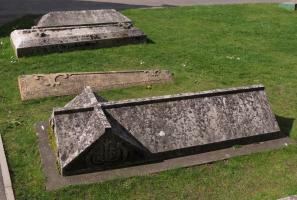 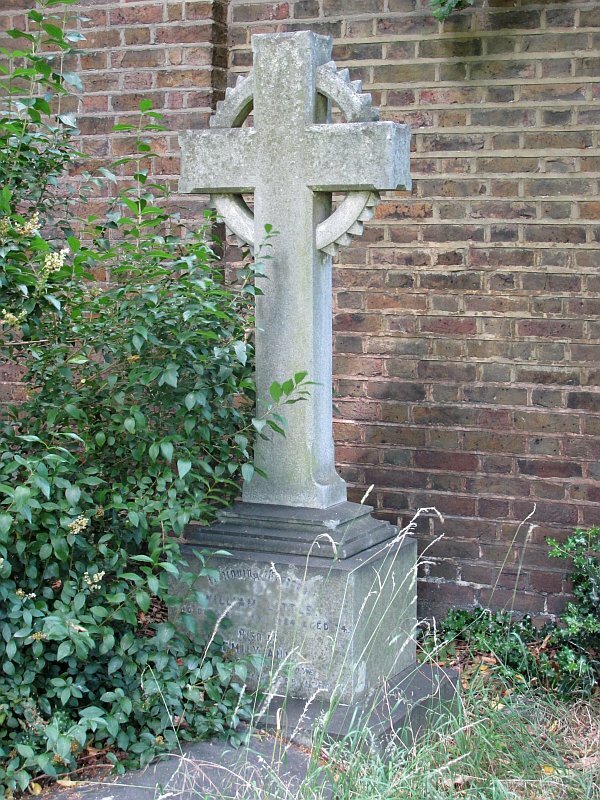 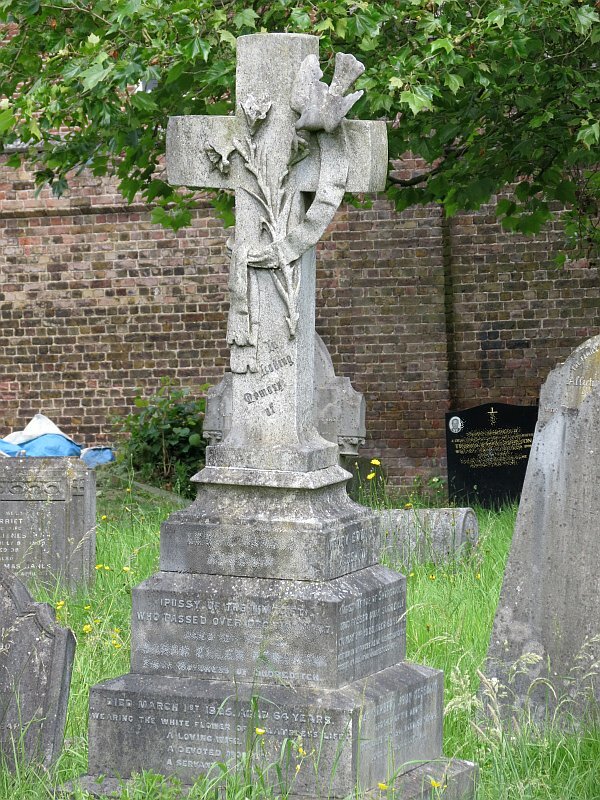 Finally, a few random examples to show some of the further variety which the cross can give to our churchyard monuments. 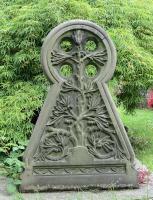 Left, a composition derived from a Canterbury cross which has the aspect of a keyhole, with a stylised olive tree carved upon it in high relief. 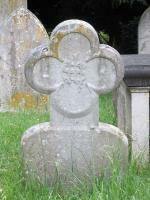 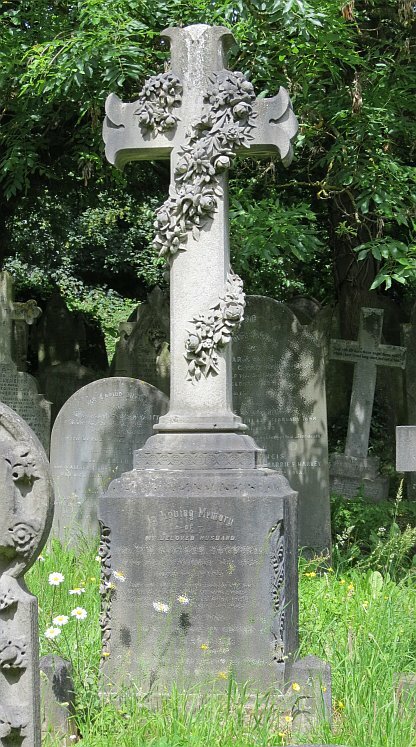 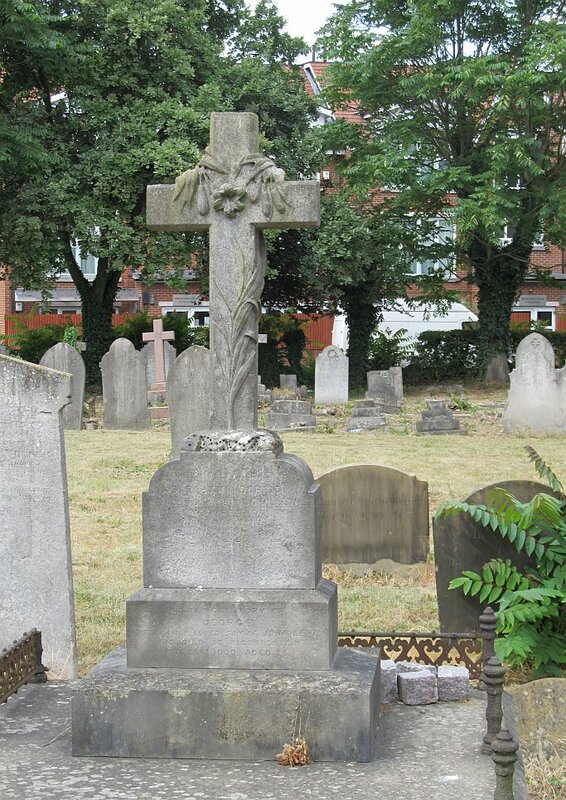 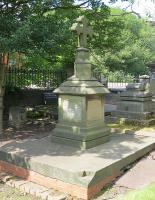 Then a dumpy little monument with a stylised daisy in the centre of the cross. 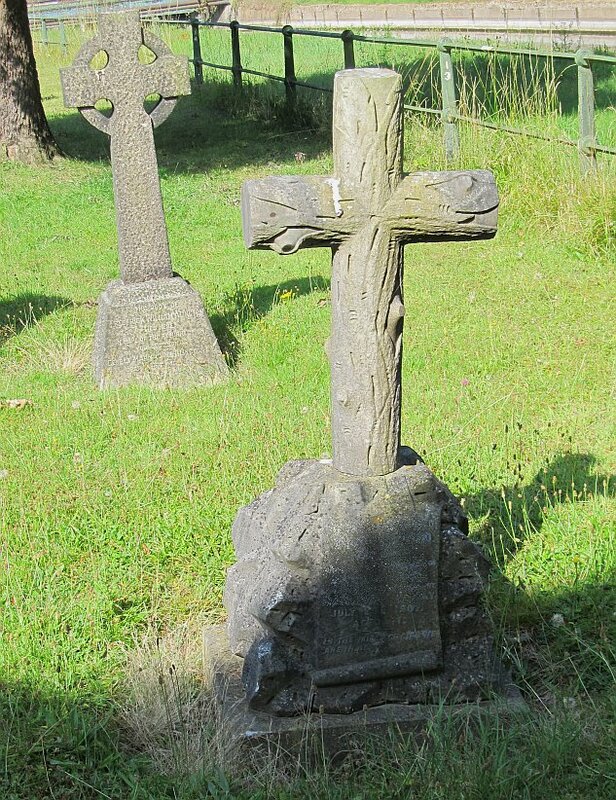 Next, a Germanic 'Iron Cross' monument, undecorated and severe. 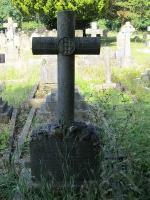 A charming Latin cross with a ribbon wrapped around it. 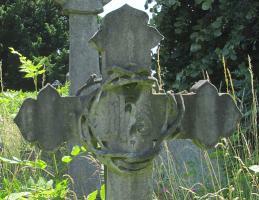 And to the far right, a simple variant of the 'keyhole crucifix'. 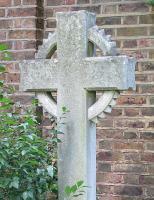 Below left, a Deco cross, with the shaft being thick enough to allow for a long inscription, and Celtic low relief patterning on the edges and in the centre. 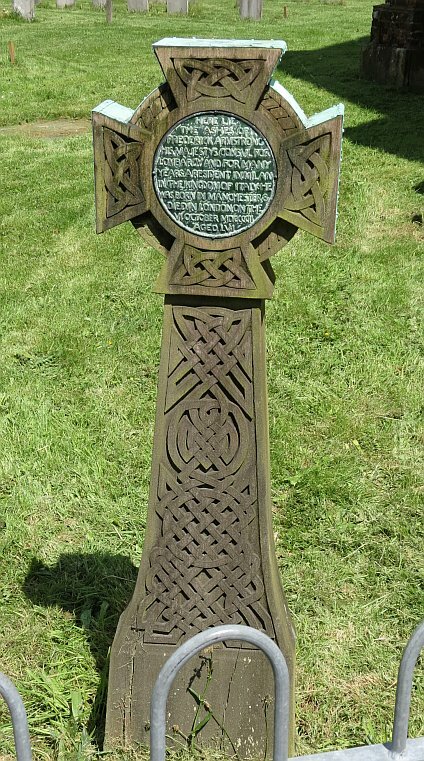 A gothic tablet forming the frame to a central cross. 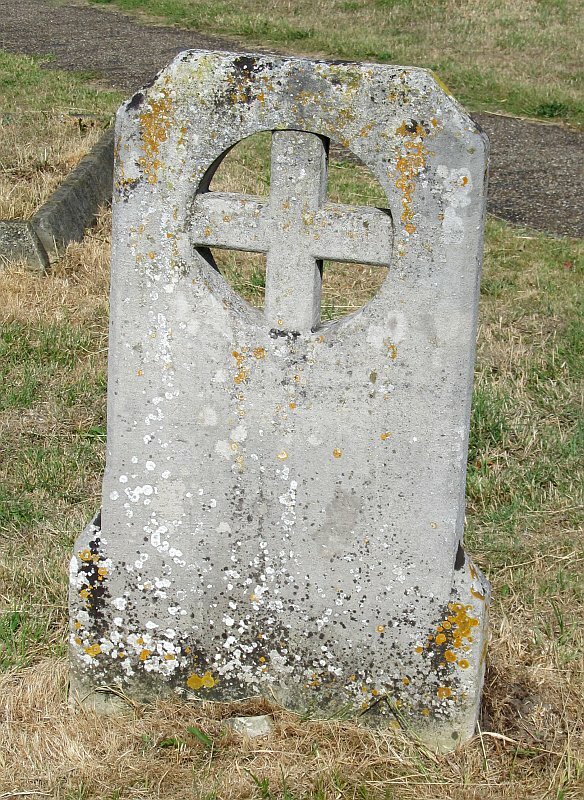 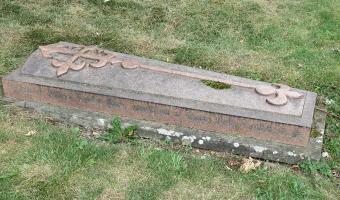 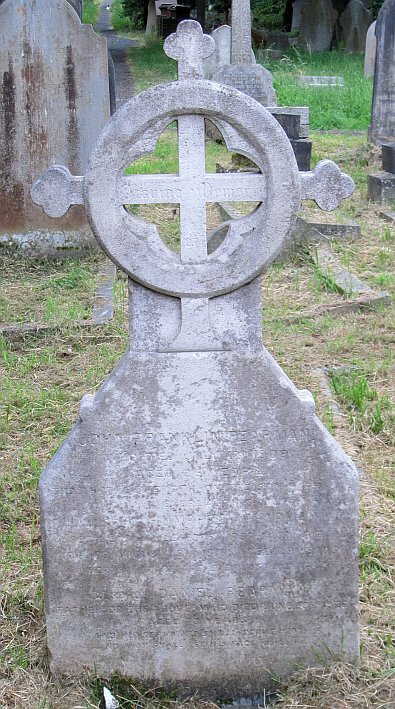 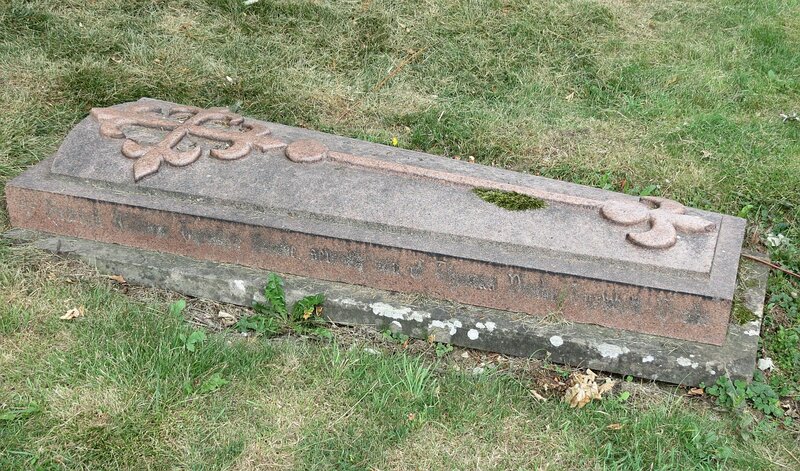 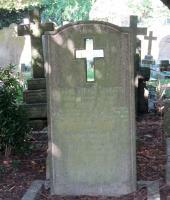 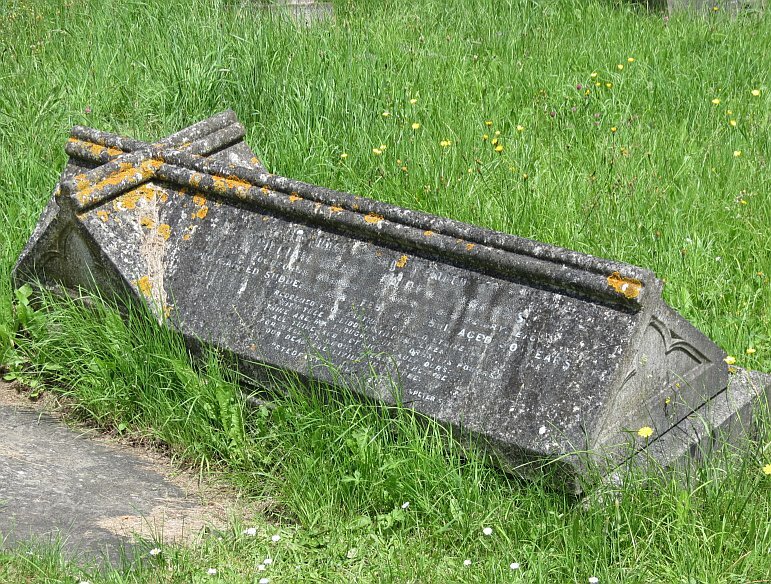 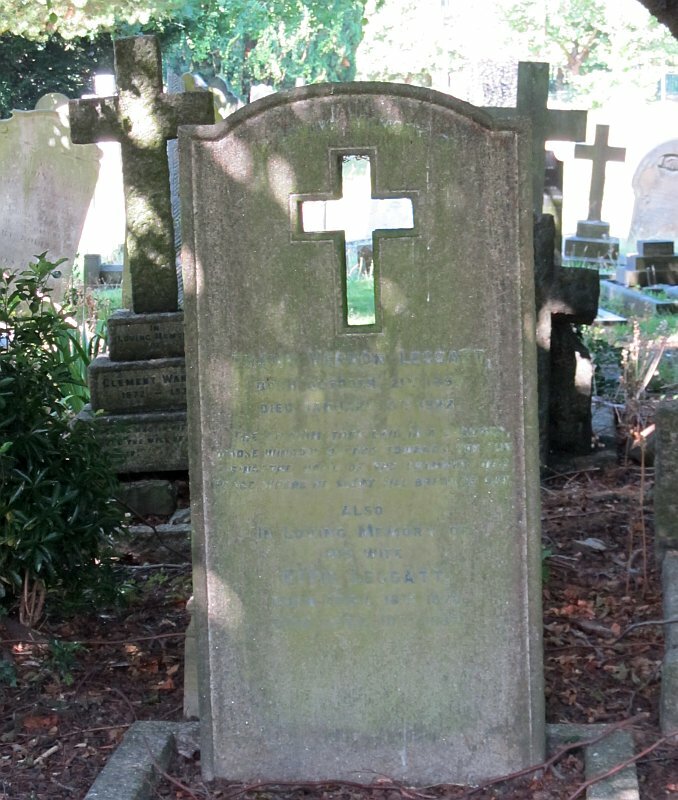 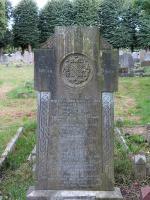 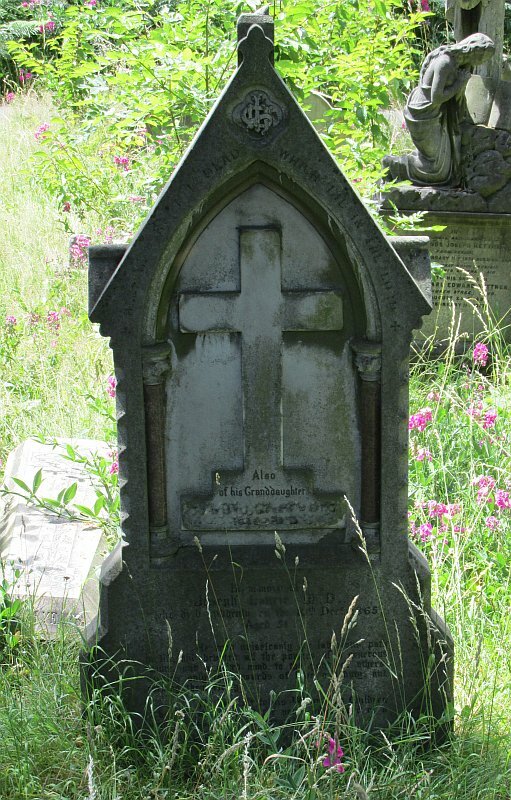 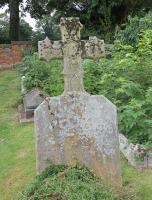 Then two different variations of a 'cross window' in a conventional headstone. 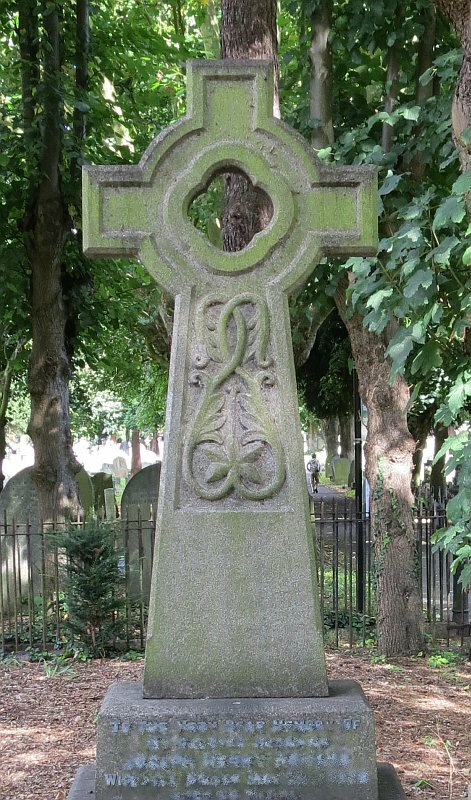 And to the right, a Celtic cross with the uppermost arm rising to a point, and a different variety of the same with the centre entirely missing, to give a small quatrefoil hole. 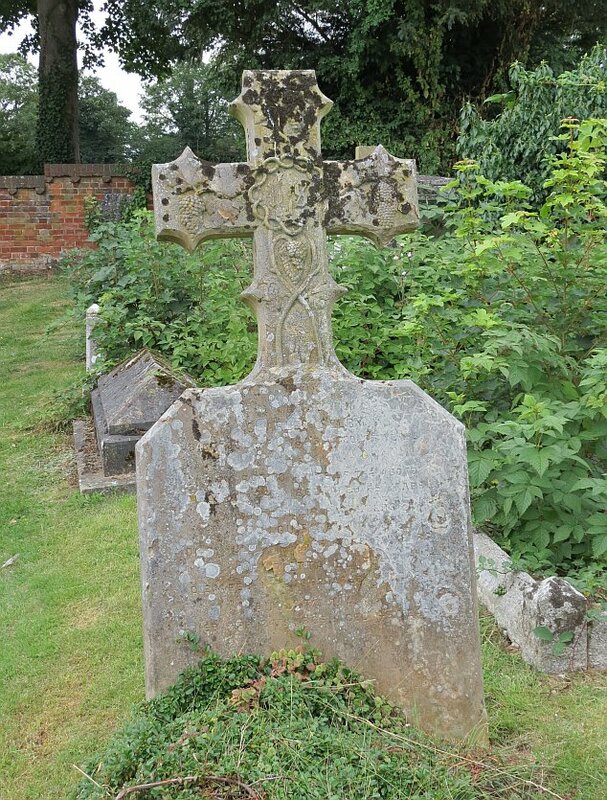 And that is not quite the end of the page, because we did not mention the horizontal slabs with crosses, or raised ledgers, which are really rather frequent. The first four pictures below give a fair sample of the common types, which although produced well into the 20th Century, hearken back to some the oldest Church monuments. The last two show variants: a raised crucifix on an informal oval base, and a whole monument raised up in crucifix shape, as if some Gothic shrine. 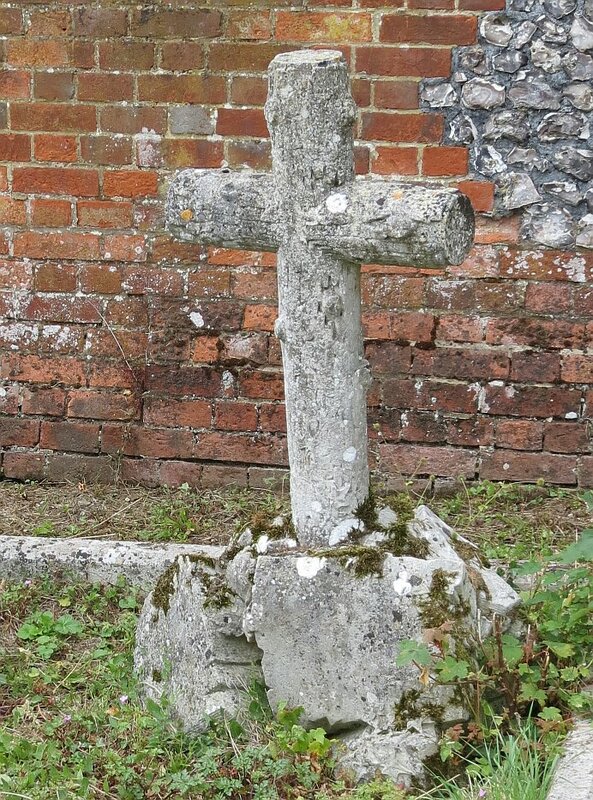 Crucifix on a raised ledger . 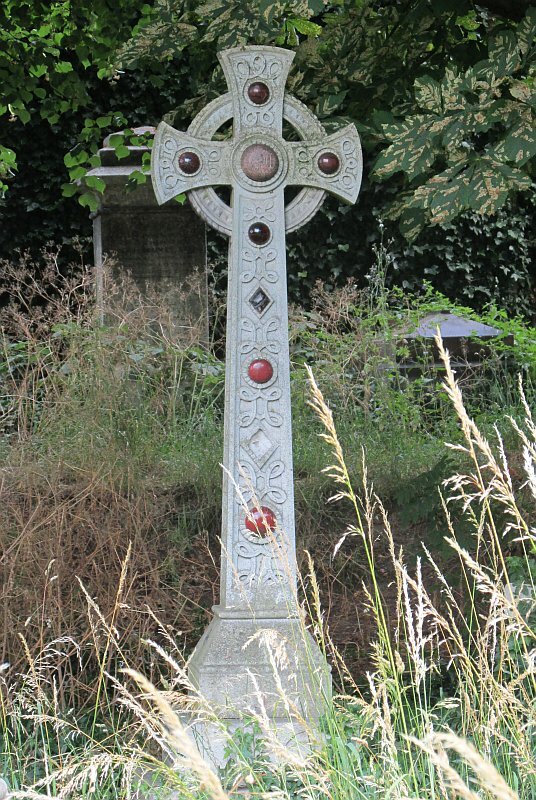 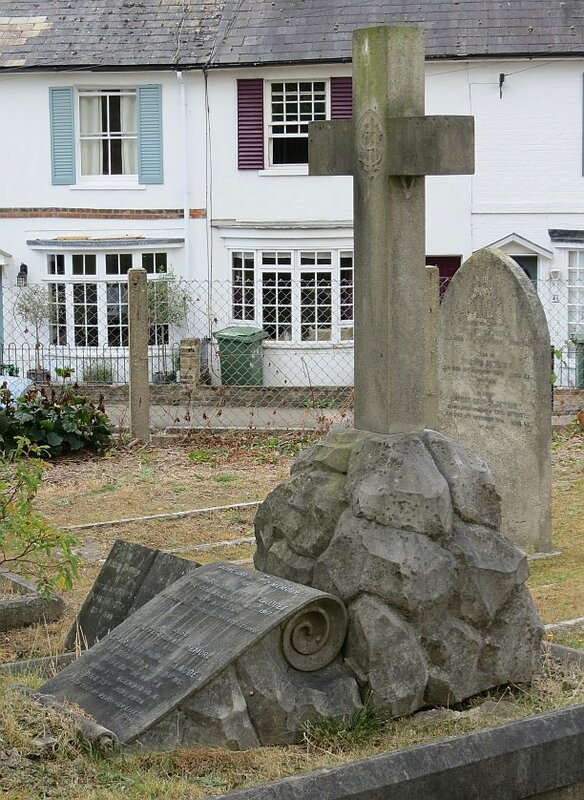 An example of a small churchyard with a fine variety of crosses pictured on this website is Harrow on the Hill churchyard, north-west London, on this page. 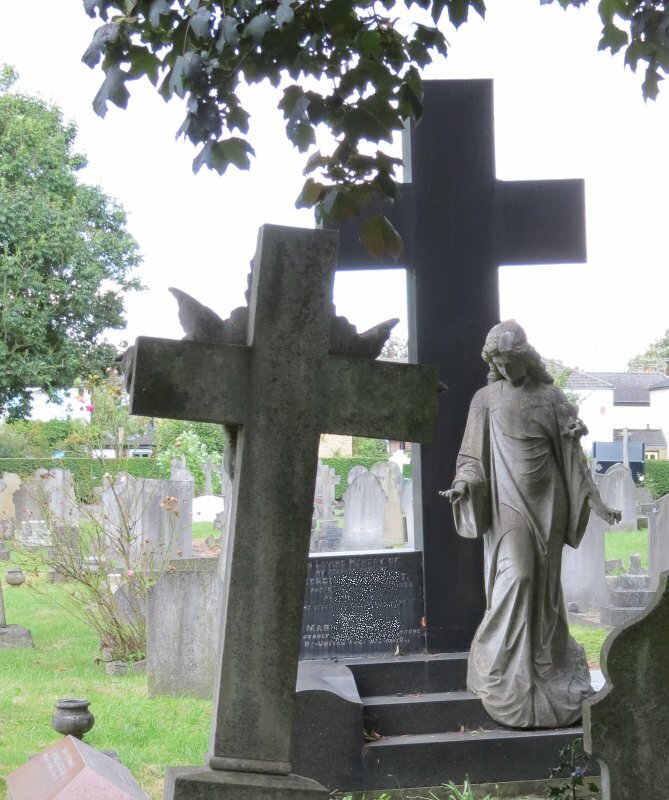 This page was originally part of a 'sculpture of the month' series, in this case a seasonal page for the turn of the year to 2016. Although the older pages in that series have been absorbed within the site, if you would wish to follow the original monthly series, then jump to the next month (Feb. 2016) or the previous month (Dec 2015). 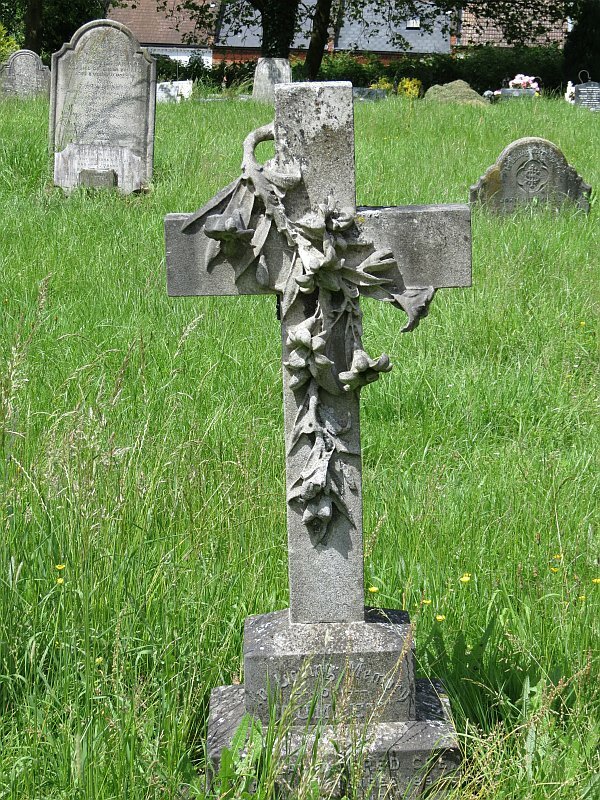 To continue, go to the bottom of each page where a paragraph like this one allows you to continue to follow the monthly links.